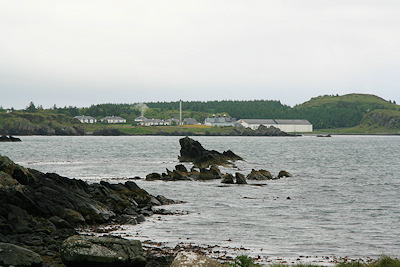 Little did we know that in later years we would stop at the cottage on the left hand side of the Port Charlotte photo ! 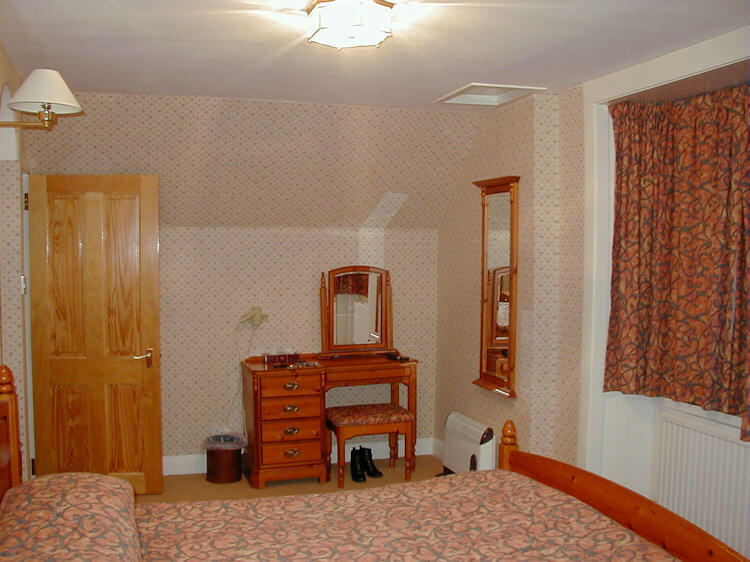 2003 was our last stay in the Lochside hotel , after this summer we went self catering . Hebridean Isles from the Jura Ferry . 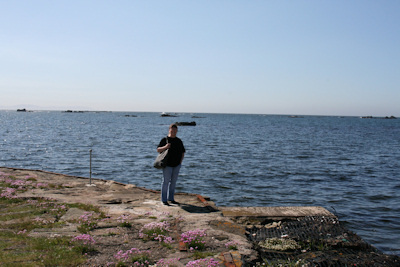 Mel fights her way through the crowds on the Big Strand…..
2004 was a special year for us , it was our 10th Wedding Anniversary and we spent it on Islay at the Old School in Ardbeg . Stopping just up the road from the distillery meant we spent a lot of time in the Old Kiln . 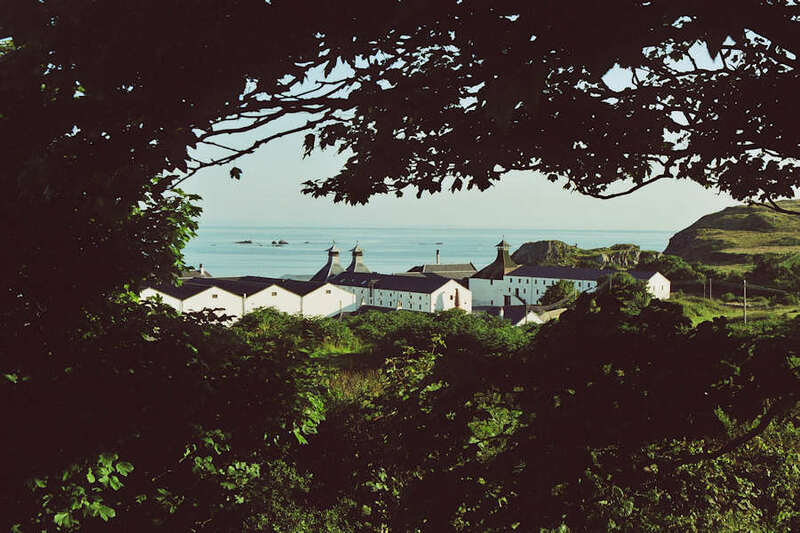 Which also meant we picked up the special release 1990 for the Japanese market…… We also did our first walk on Islay , through Bridgend Woods . 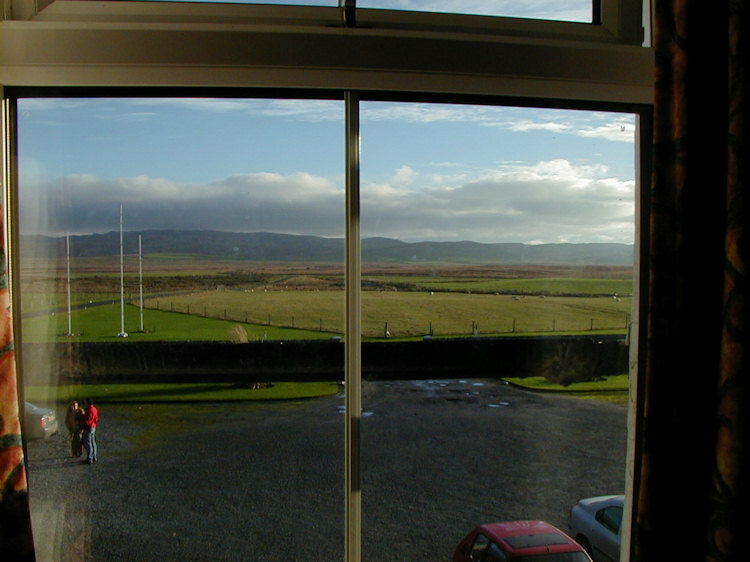 It was a great stay on Islay , the weather was gorgeous and we had a great wedding anniversary ! 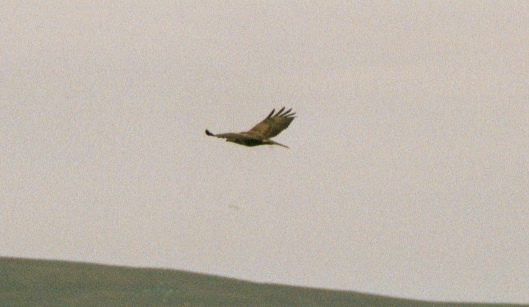 A Compendium of Old Islay Visit Photos that don’t fit in anywhere else…..
Rummaging through old photographs i found some that may (or may not) be of interest from early visits to Islay . 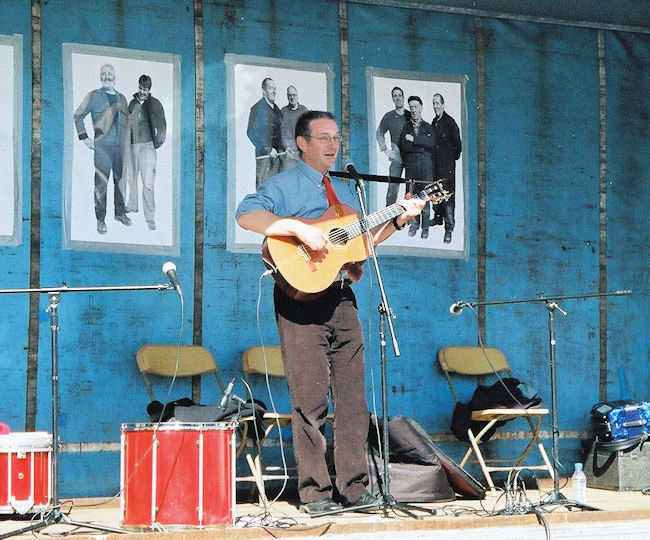 The first two small but perfectly formed offerings are from our very first visit in 1999 i think , i must have the originals of these somewhere……. 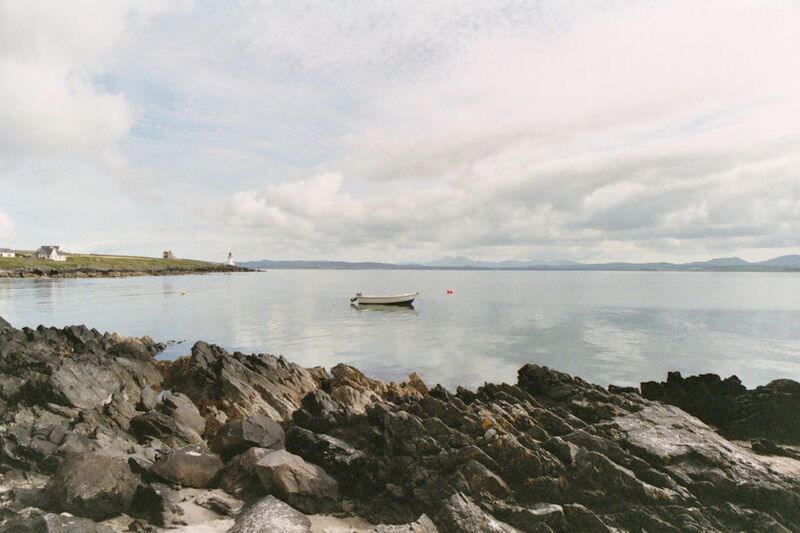 Taken on a lovely summer day at the Back of the Lochside hotel , it was a great place to sit with a dram looking over Loch Indaal taking in the Rays ! Love the Aerosmith Tour T-shirt ! 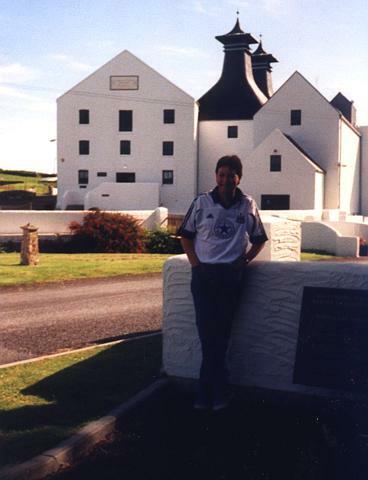 Me at Lagavulin , still got that top……. 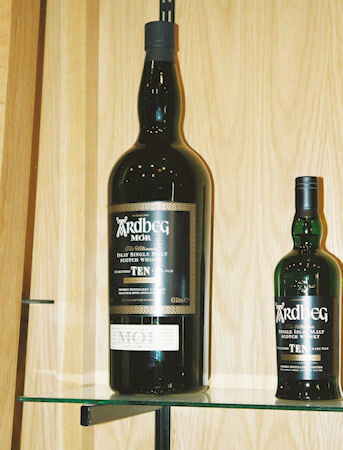 So onto 2001 , first visit to the re-opened Laddie , first visit to Lagavulin and another visit to Ardbeg……. The filling of my first valinch , the original way , by hand with a….eh….Valinch ! 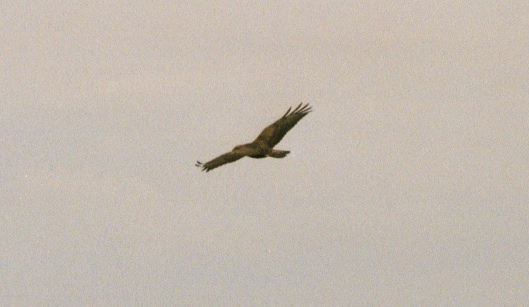 Haven’t a clue what it was , Buzzard ? 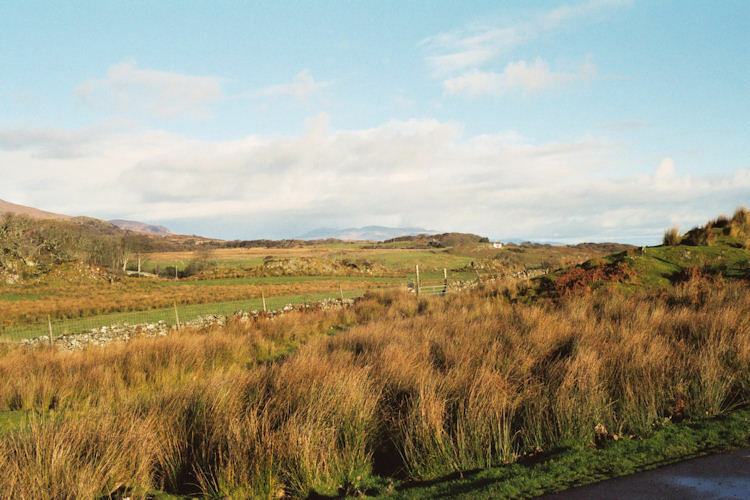 After 7 trips to Islay during the spring and summer at the end of November we took the bold decision to visit Islay in the late Autumn , mainly to see what the Isle looked like in a different season ! 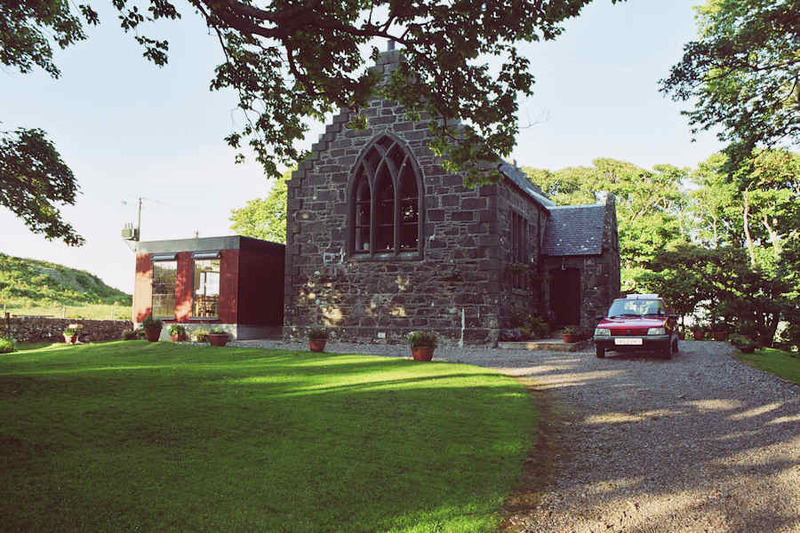 So on the 28th November we headed off in our trusty Red Peugeot 2005 for 2 nights in the Machrie Hotel…….. Boy was it good ! It was incredible and it just fitted in so well with sitting in The Old Kiln . One of those moments happened next that you wished you took the person up on , now bearing in mind this was the time when e-bay hadn’t infected anybody and bottle chasers were the thing of the future and Ardbeg Committee bottlings were £25 a shot , Jackie came over and asked “How many do you want then ?” . “Three please ” i replied , “Cases ?” she said…….. I did take 3 on the day and eventually got 3 more , bottles that is not cases……..
We did eventually get to the Hotel and checked in . 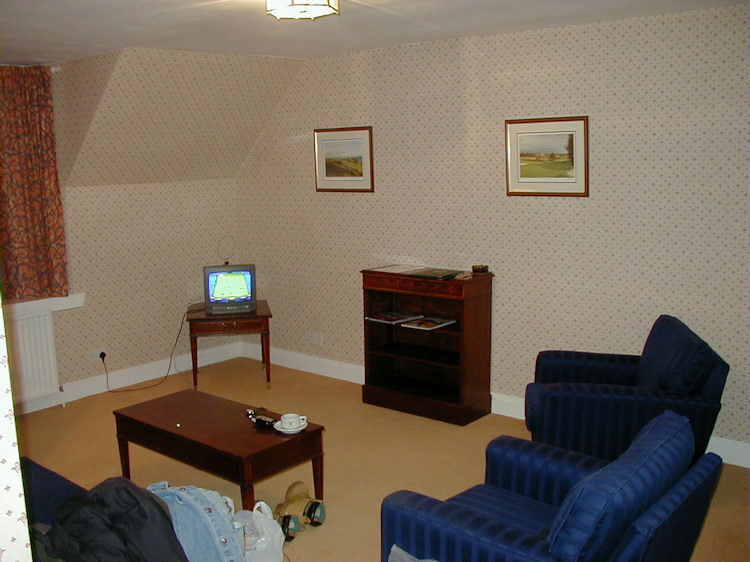 Now i never really took notes on this trip , we did eat both nights at the Machrie , the food was very good , as were the rooms……..
We were slightly shocked by the “Room” , we’d gotten a deal for the weekend and ended up in a Suite with a sitting room and changing room ! The view out of the window was very nice . Staying here also gave us our first sight and sound of the wintering Geese on the Saturday morning , flying over the hotel on their way to the fields . Now neither of us are interested in golf so needless to say we didn’t take advantage of the attached Golf Course , We did however drive around the Isle admiring the Autumn scenery in what turned out to be a very warm weekend . T-shirts only on the Sunday ! 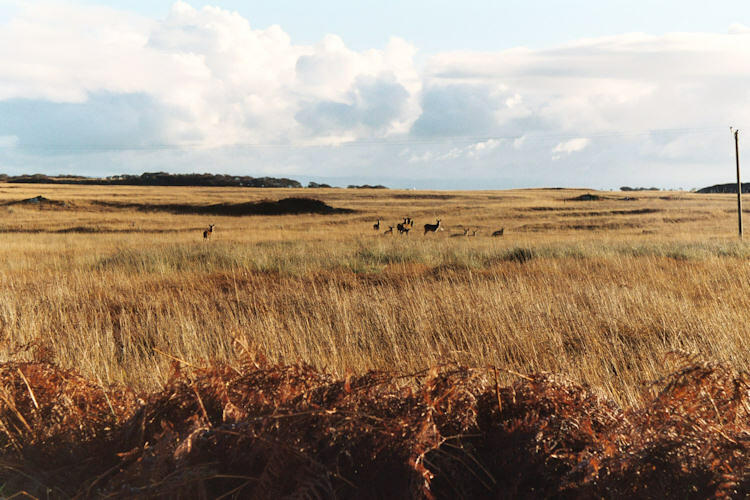 This was also the first time we had a good sighting of deer on the Isle , mainly due to the fact that they had come down off the hills and were grazing on the low peat bogs along the way to Kildalton . 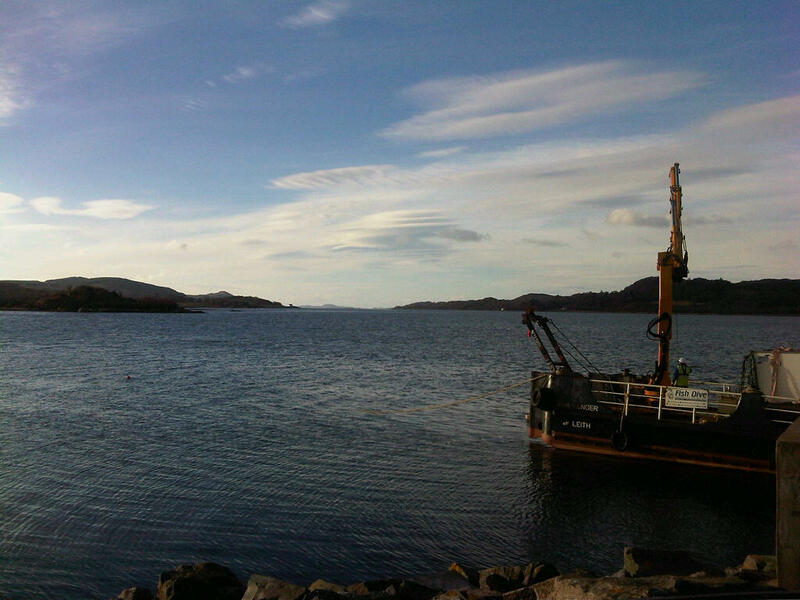 We had a great weekend , eventually departing the Isle on the 3.30pm ferry ( The only ferry on a Sunday then….) . 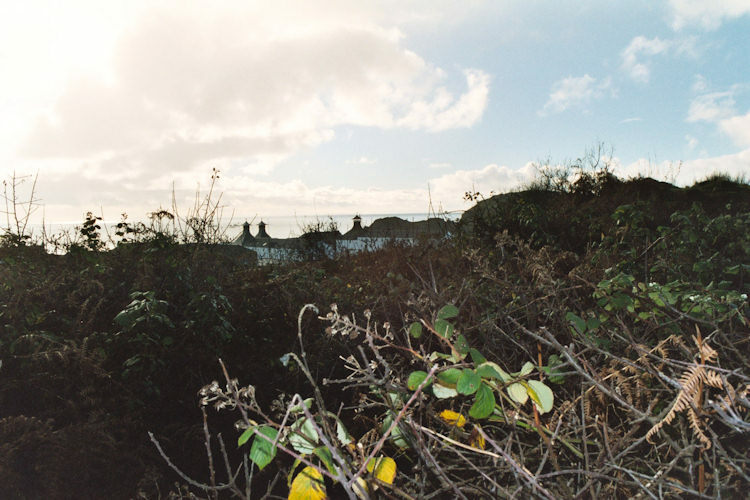 Everyone should visit the Isle in the Autumn , the colours are outstanding ! 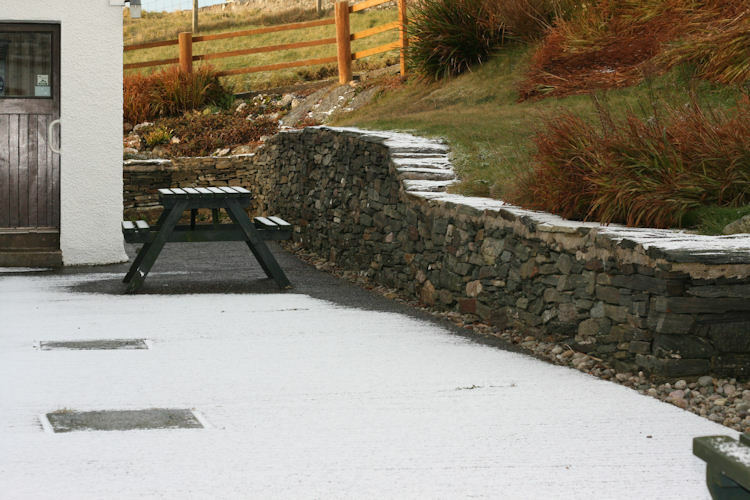 We awoke to a sight we didn’t particularly didn’t want to see at 4am in the morning , snow ! Maybe at this point we should have thought about not going……. It was slow going at first on virtually ungritted roads but by the time we reached Hexham the roads were clear and we had a beautiful sunny drive up to Kennacraig . 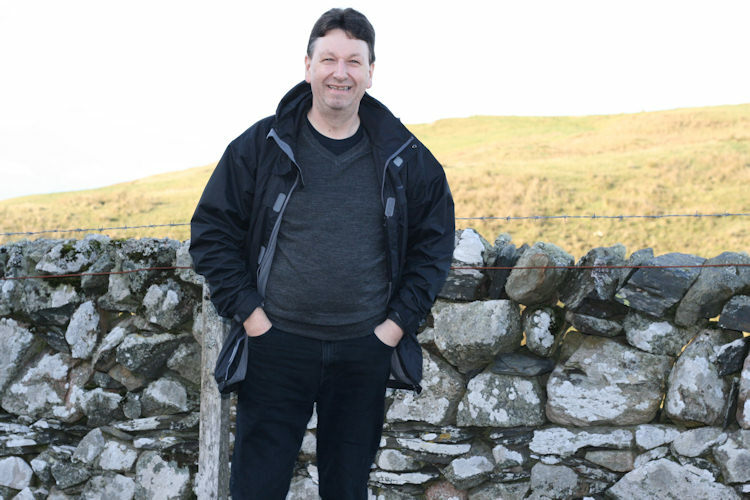 At Kennacraig we bumped into a good friend who was also heading over to Islay , that well known Scottish artist Ian Gray . 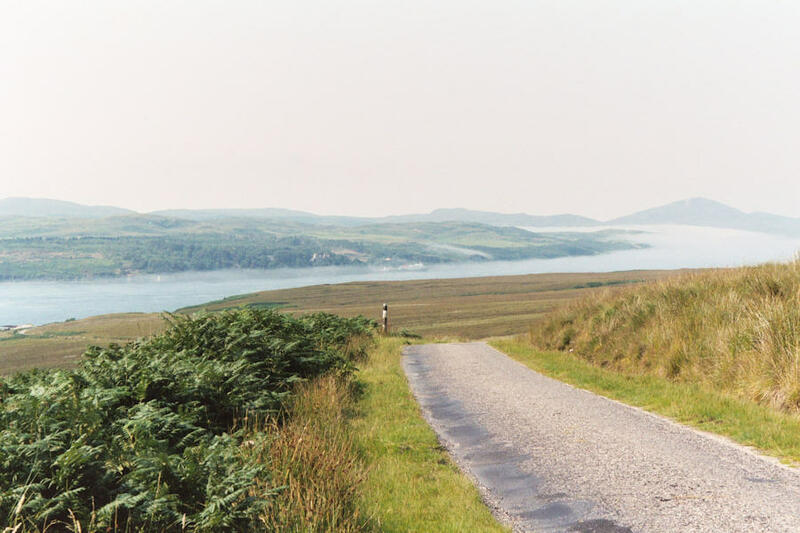 We both had to reverse onto the ferry (for reasons best known to Calmac….) , somewhat easier for me than Ian , but even harder for a large item of Electrical equipment on a lowloader that was also heading over ! We ended up catching up on quite a bit of gossip on the ferry over before heading our own ways once arriving on the Isle . 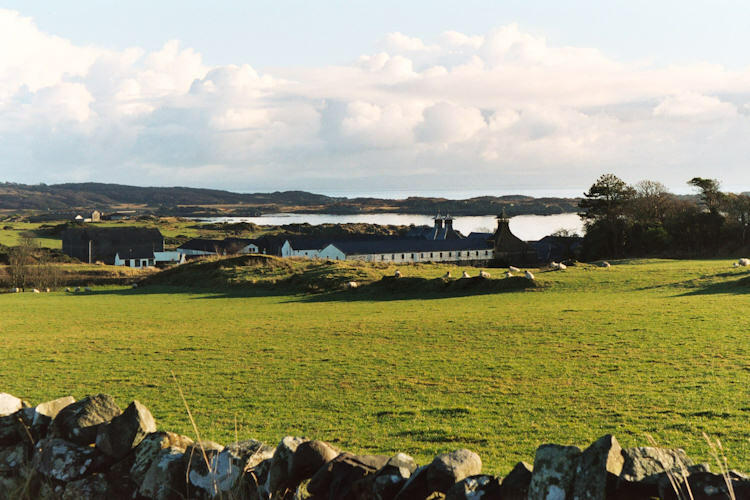 After a stop off to pick up a few bits and pieces we eventually arrived at our accommodation in Port Charlotte , the Lorgba cottages . After a freshen up we headed off to the Port Charlotte Hotel for something to eat and an evening of drinking and gossip . We met up with Ian again , a couple of his friends Andrew and Barbara and later on Mark Usworth . After a couple of pints of Angus Og (this is my Fav Islay Ale , superb) , a Black Bottle 10yo (woo-hoo) and the new PC (the multivintage one….) 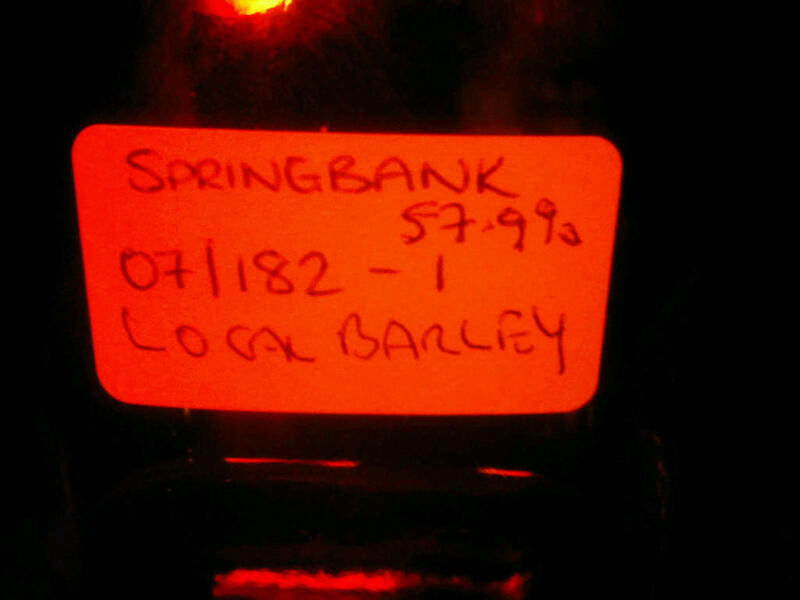 Ian produced some Springbank samples , his own bottling , a rather nice 12yo i think and a 1999 ‘Local Barley’ . A good night was had by all ! This morning we decided to forgo the motor and took the bus to Ardbeg , it was a cold but sunny morn and a lovely journey across the Isle .It’s always nice to let someone else do the driving……it also means i can have a drink ! After a cup of tea we were joined by Mickey and enjoyed a good natter and a few drams . 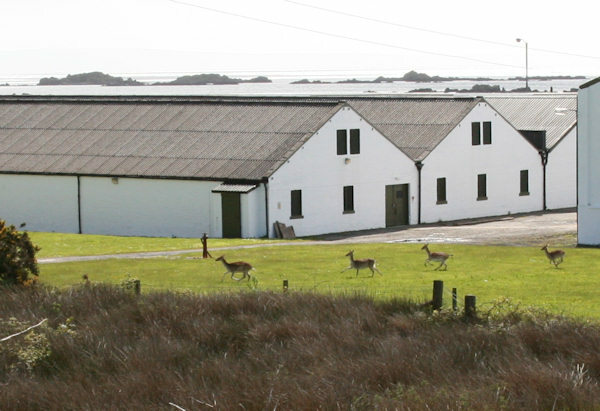 All is well in the distillery…..
We had lunch , which as usual was excellent , the Islay Crab Chowder and Homemade Raspberry trifle were to die for ! After succumbing to the current Ardbeg Single Cask (which is actually a superb Beg ) we got the bus back to PC , having to change at Bowmore so a quick visit to Duffies was fitted in . Tonight we just relaxed in the cottage with a coal fire and a handful of CS Begs ( the new O.b. SC , 33.91 , 33.96 and Renaissance) . Another full day to go tomorrow !!! Bit of a shock when we got up this morning , Snow ! Not a lot but a sprinkling . 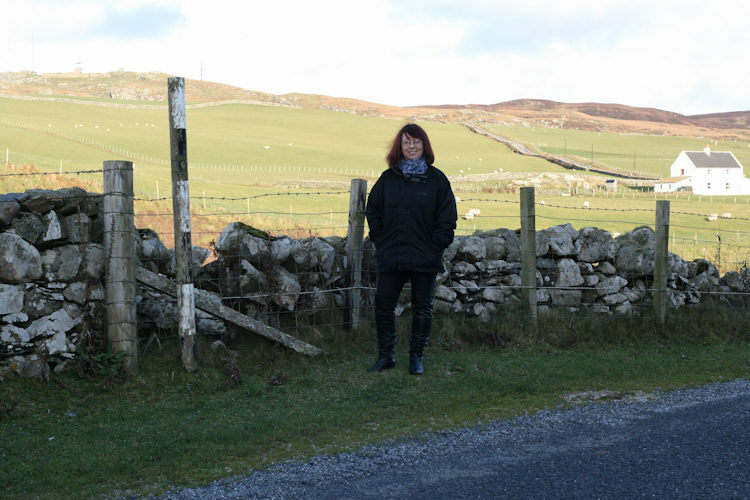 We went for a bit of a drive down the bottom end of the Rhinns , a gorgeous drive in the Clear , sunny winter sunshine . On the way back we popped into Bruchladdich to see Mary but she’s stopped working Saturdays , we then went over to Bowmore to pick up a few bits and bobs (including a new Bunnahabhain 12 at the Spar shop , on offer at £28.99) and returned for a relaxing afternoon in the cottage in front of the fire with a few drams . 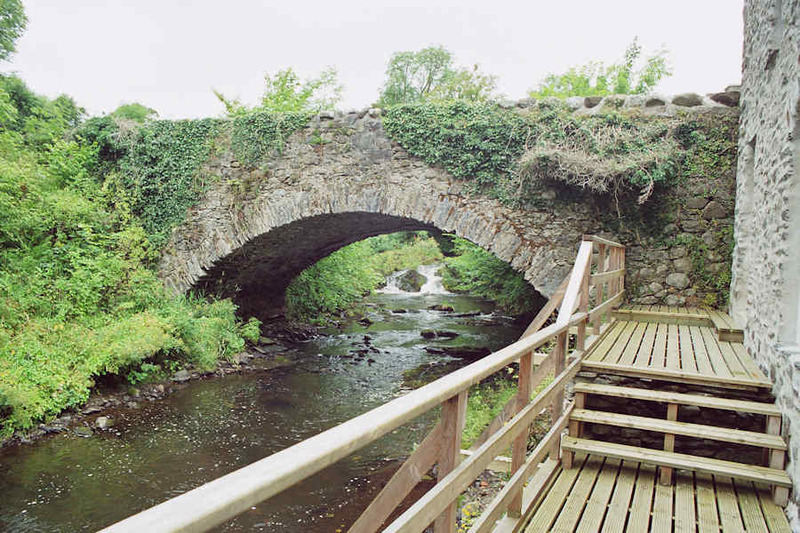 We decided to go over to the PC hotel for a meal and a few drinks and bumped into Andrew and Barbara again , amongst the drams tried was the new Laddie Organic , not as good as the 2003 imo , we then returned to the cottage to see out the rest of the evening and pack up our belongings . We arrived in West Loch Tarbert to horizontal , driving snow ! It was slow going along the A83 and just as we got to Rest and be thankful….the police shut it . So we turned around , drove back to Inveraray and then headed up to Crainlarich only to get there and find the A82 was shut down Loch Lomond ! So we headed off down the A84 and A85 to Stirling in some of the worst conditions i’ve ever drove in . We got off the Ferry at 12.05pm , it was 8pm by the time we got to Stirling…….We gave up , found a room and settled down for the night with a hearty meal and a bit of booze ! 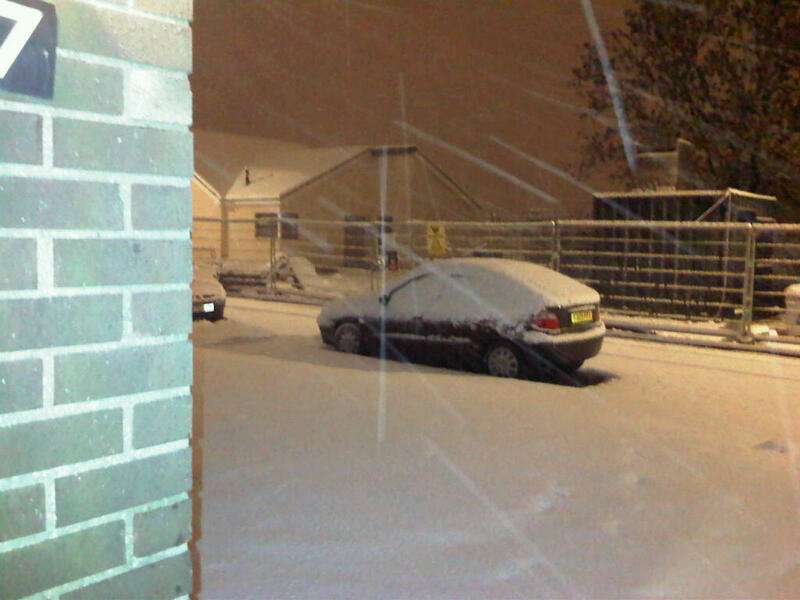 The Roads were still pretty bad but usable , there was about 6 inches of snow on the car when we went out . After Breakfast and phonecalls to respective employers we headed off homeward the long way…..The A1 was closed so we headed over to Glasgow , down to Carlisle and then back across to Newcastle , eventually getting home mid-afternoon . For the Eighth Year we’re back at Festival time ! 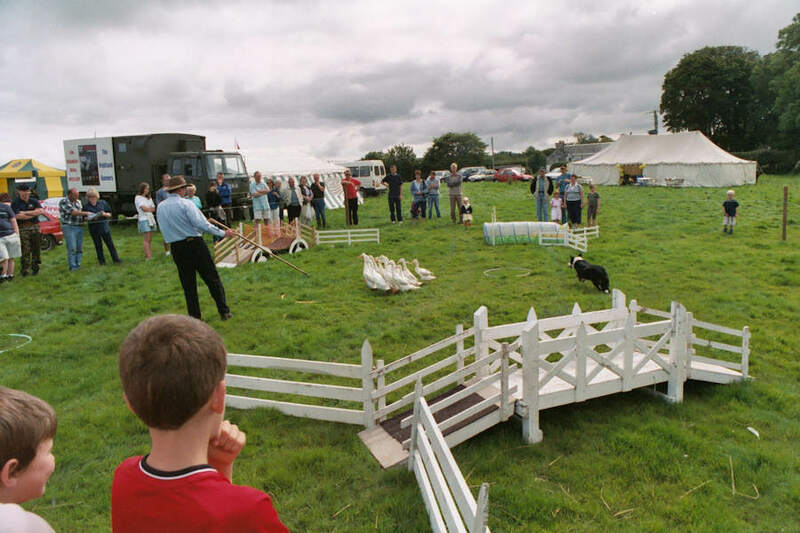 We’ve decided to make this he last visit to the Festival for a while as we seem to have been gradually attending less and less events over the years . 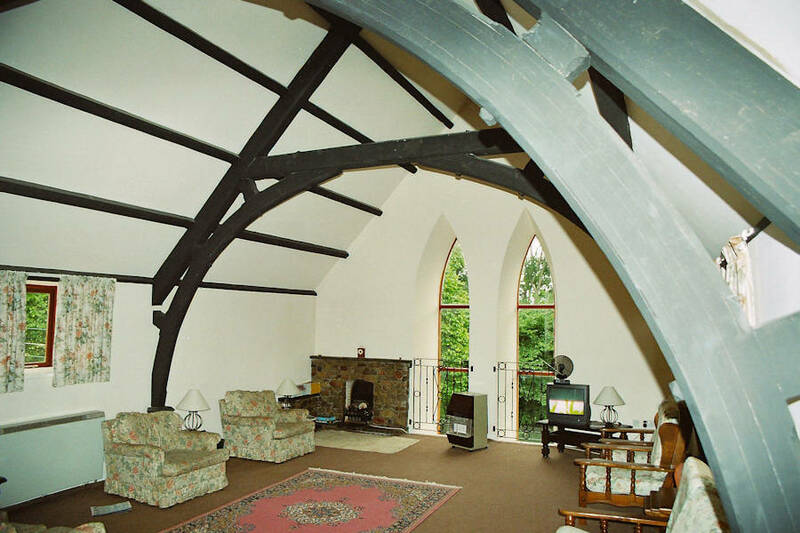 Given the extra cost involved in accommodation we will be moving our Spring Holiday to another week . 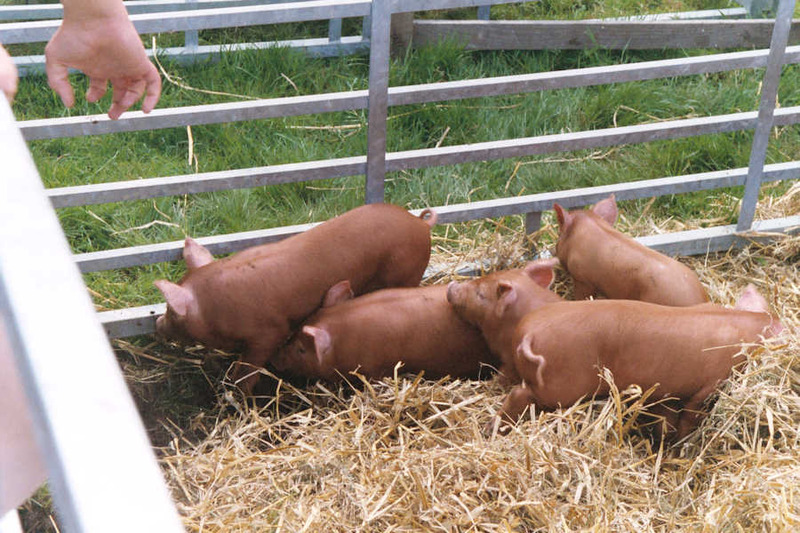 So to what we got up to………. Due to the 1pm being full by the time we got around to booking up , it was the 7am one for us which meant an overnight journey . A fairly uneventful journey apart from an accident on the M74 , the M8 being shut , getting pulled over by the police on the M8 Diversion ( apparently they were worried about the amount of breaking i was doing , wondered if something was wrong …..Yeah i didn’t have an Ffing clue where i was !) 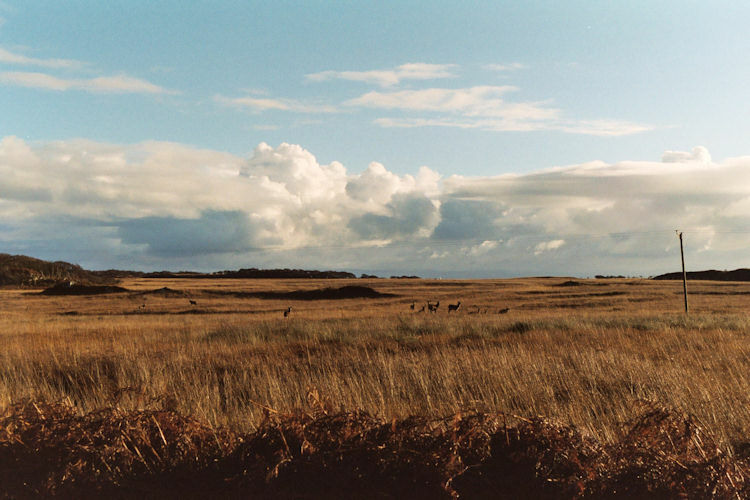 , 2 Stags , 1 Barn Owl and a Fox ! 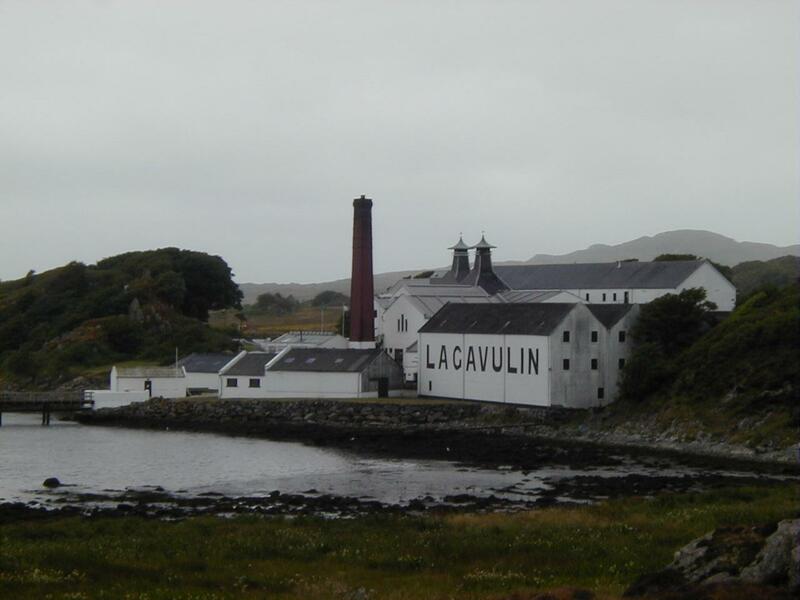 After a Supernova (first dram on the Isle of this visit…) , purchasing 2 of each , Tea and Scones and a chat with Mickey and Jackie we headed off to Lagavulin for a Tour with Marjory . As usual it was a pleasure doing a tour with Marjory , at the end we got a dram of a 1993 , 16yo at Cask Strength . Very nice it was too ! Eventually after a plate of Scallops , a trip to the Co-op , chat with old friends we went to Our place of residence for this Holiday ,The Garden Cottage at Tigh Cargaman . We started the Evening with a Fish Supper from the Legendary “Nippy Chippy” , Superb as usual ! Then it was Time to try todays Purchases….. This Morning i had the great pleasure of Accompanying Mickey Heads up to Loch Uigeadail . As many of you know the wall holding the water in has been leaking for over a year and they started doing repairs on it a few weeks ago , he had to go up and have a look at the building work and kindly agreed to let me tag along . Having never been up to Uigeadail i didn’t realise what i’d let my self in for ! The first bit isn’t too bad up to Loch Iarnan (the Closest of the two water sources to the distillery ) , this loch will also be getting some attention in the near future . The next stage included Peat Bogs , climbing a deer fence , spotting deer and following the line of the water course , the climb up to Loch Uigeadail was very hard on the legs but worth it to get the views from the top . 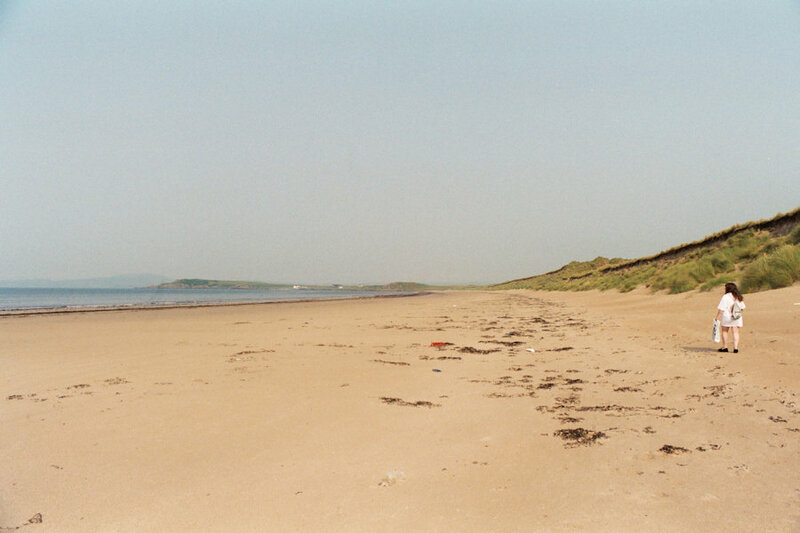 You could see clear across to the Mull of Kintyre and Northern Ireland . 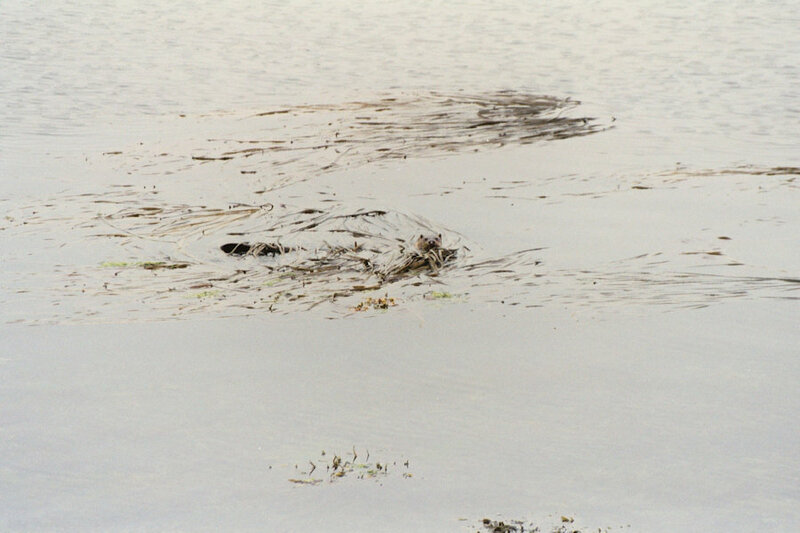 The water in the Loch was fairly low , mainly due to the problem with the leaking wall and the repair work going on….. 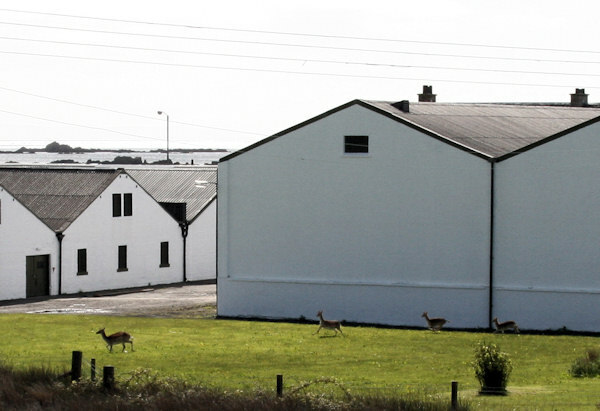 So after a break we headed back down to the distillery , avoiding herds of deer amongst other things! We decided to hit the bright lights of Bowmore for our meal this evening , having a curry at the Taj Mahal . It was excellent ! We even managed to have a drink in the Lochside beforehand , tried the Bunnahabhain Moine (festival Bottling ) , wasn’t the best peated Bunnahabhain i’ve had so will probably give it a miss. Not a bad line up ! Tasting notes for the 772 are as follows…. Colour – Bright Gold . Nose – Creamy Fudge , Slight Smoke , Lemon , pine nuts , the lemon is the most dominant one of the lot and when water is added seems to increase . Taste – Menthol and Strong Coffee . Finish – Long and Menthol . 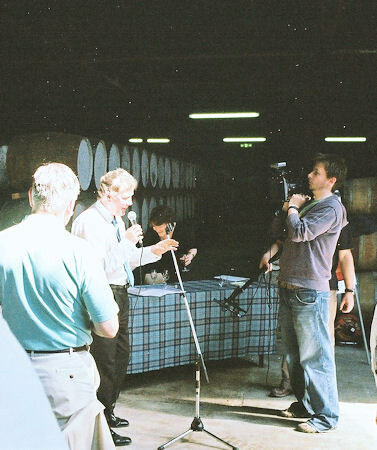 Comments – Dist 30th April 1992 , Bottled 10th December 2008 , 184 bottles from a 1st Fill Ex Bourbon Cask . 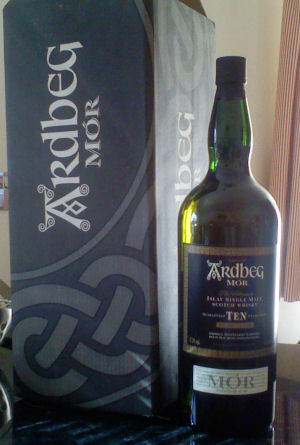 not a bad Ardbeg but not what i would say was one of my favourite and certainly , imo , not worth £192 a bottle…..
On tasting the two Festival together for the first time i would say the 1190 is my favourite . 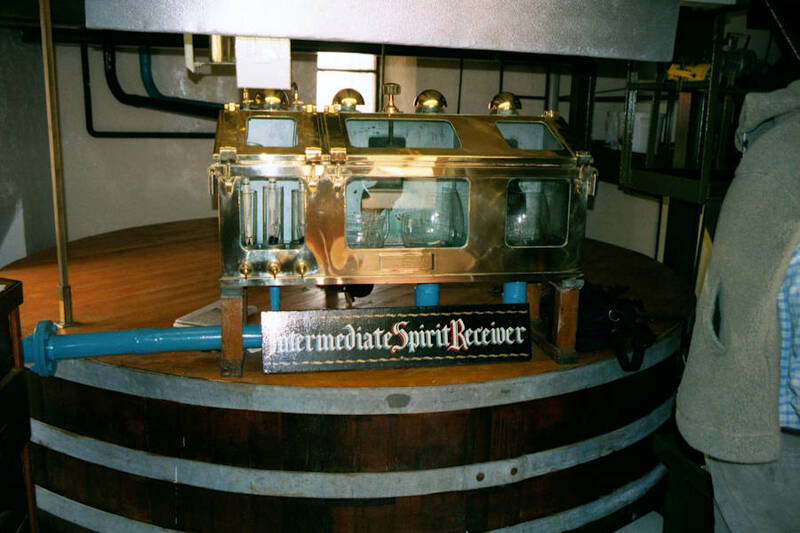 It was great seeing the difference between fresh and refilled Casks and it was very noticable , needless to say the spirit also improved with age , the 9yo 1st fill was cracking stuff , very Renaissance like . The older sherry one was also the best of the sherried ones . As it was Monday it was Nosing Competition night and once again we managed to fail Gloriously ! Met up with Willie for the first time this week as well and bumped into Tim from the Whisky Exchange and the Caskstrength .net boys . Who says Ardbegs are too Deer ? A bit of a quiet day today for us , had to go down and pick up the car just before lunch , it’s nice to go down to Ardbeg by bus , gives me a chance to view the Scenery for once . 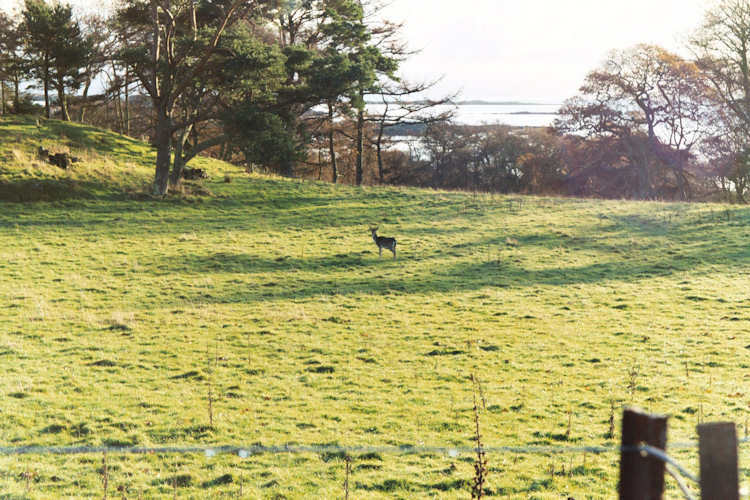 When we got off the bus at the top of the road we spotted something going on down at the distilley , a small group of deer (what constitutes a Herd ?) 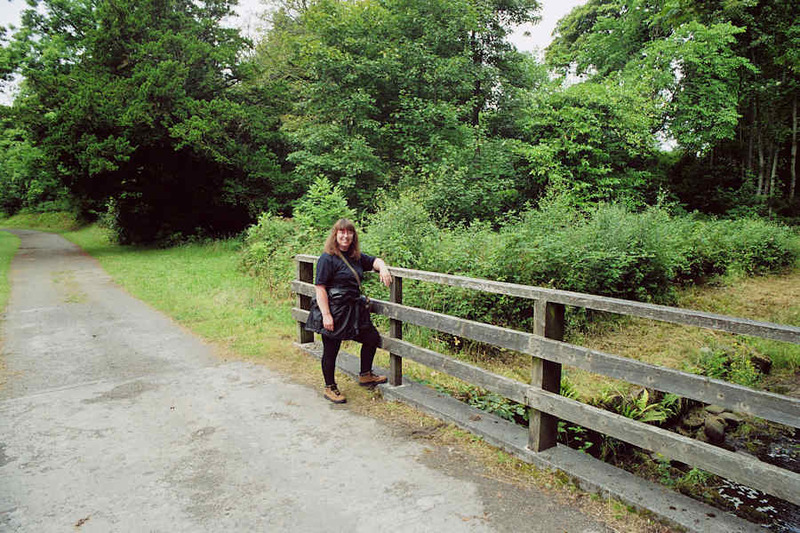 wandering around….. 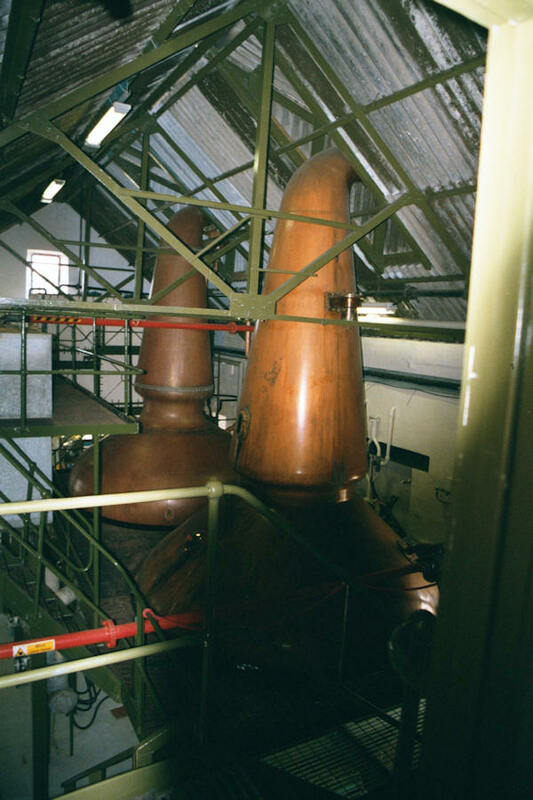 They must have “herd” how good the Whisky is…..
After the excitement we managed to “Stag”ger into the Old Kiln for a pot of tea and some Scones , now there are Scones and there are Old Kiln Scones , the lightest i’ve ever had , in fact they nearly blew away when someone opened the door ! We also managed to catch up with some old friends , Charles and June , Charles some of you may know as he ‘s a regular at the festival and makes some fantastic walking sticks . After a few purchases we headed off for a nice drive along the South Shore . 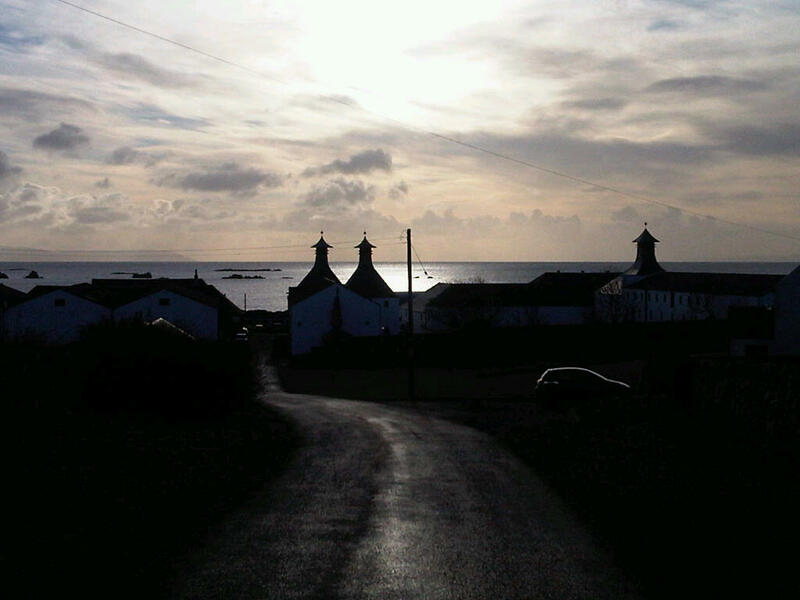 In the evening we headed over to Bruichladdich for a meal at An Taigh Osda . What can i say about this place ? 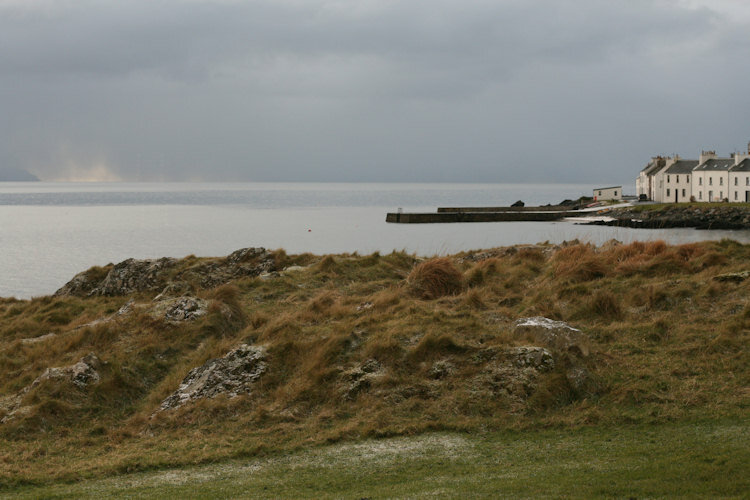 If you haven’t read about our visit last August and our stay at Easter then all i can say is Joan and Paul have the best place to eat on Islay , full stop ! We had another fantastic meal , as usual the hardest part was choosing what to have ! Mel went for the Lochindaal Crab and Lobster Fish cake for starters followed by the Gressingham Duck , i went for Crispy Haggis dumpling with a truly outstanding Bruichladdich Whisky Sauce followed by a melt in the mouth Aberdeen Angus Sirloin Steak ! 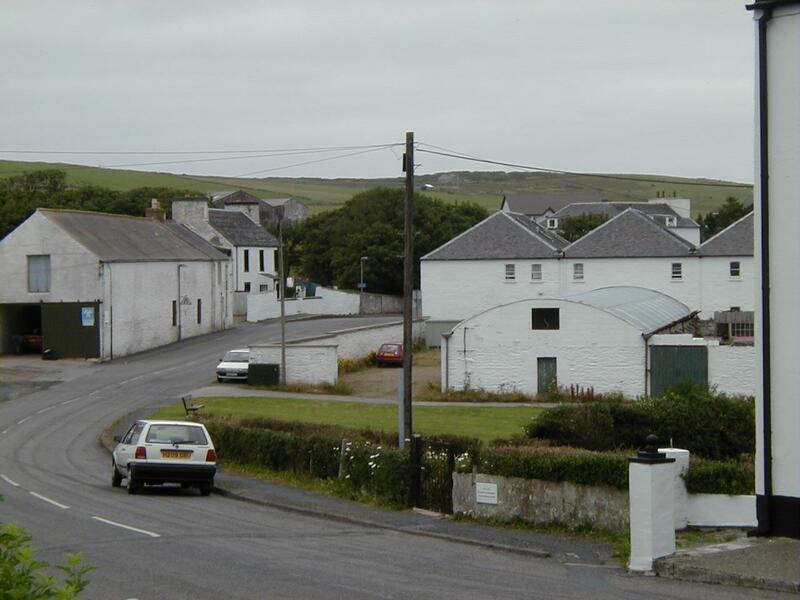 No doubt about the fact we’ll be back there on our next visit…..
Another quiet day on Islay for us , a bitof a lie in before hitting the bright lights of Bowmore for a bit shopping . Mel got a few things from Ailsa’s Spirited Soap shop then we kept bumping into people from various forums ( Ruby , Longroad , and Willie amongst others ) . 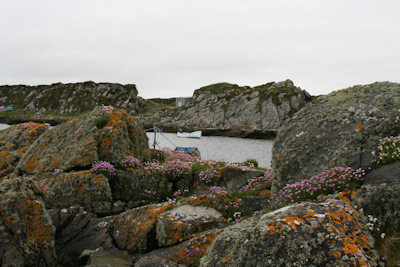 We then went for a drive down to Portnahaven stopping for a bite to eat at An Tigh Seinnse . 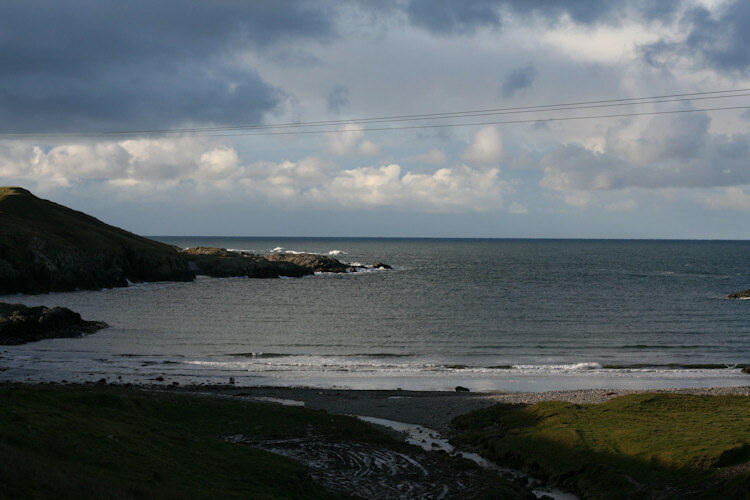 We came back via the west route from Portnahaven and a little bit of taking in the scenery eventually ended up at The Port Charlotte Hotel for Tea . The evening was spent back at the Cottage enjoying a few drams on the weekly SOI Chat . Arrived at Ardbeg this morning for todays tastings to find strange going ons…..
All will be revealed in the not too distant future…..
Once again both tastings were superb again, met Anthony Louis at the morning one , the afternoon one had a few different casks in it , a 10yo 1st fill Bourbon and a 10yo refill Sherry which was better than the original 9yo one , not a hint of sulphur ! The Evening was spent relaxing in the cottage again. 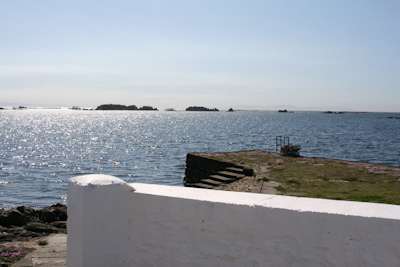 View of Swan Pool , just behind The Ard . 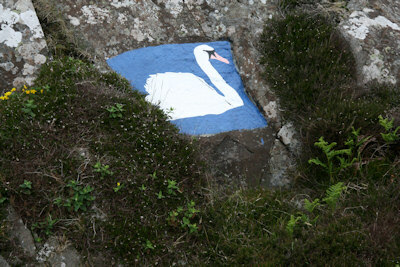 Swan Painting originally by Sean O’Leary , which has been touched up over the years by the locals . 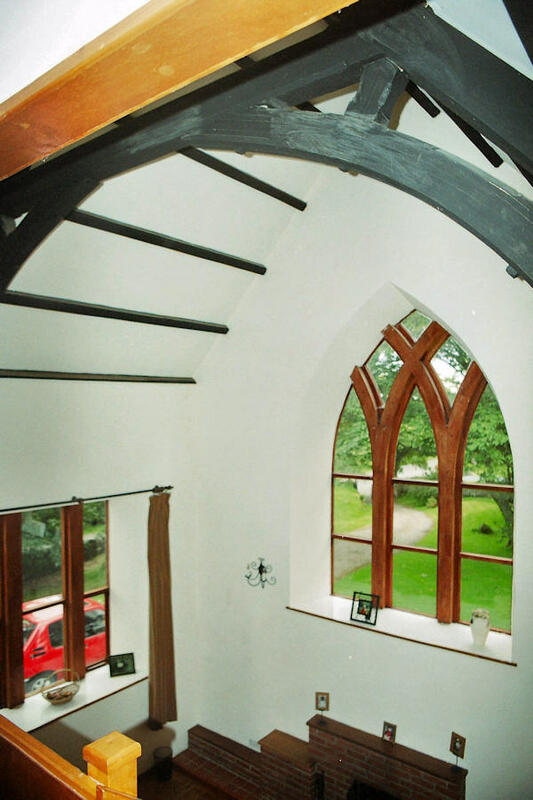 He also done paintings in the Islay Hotel , The Bowmore Hotel , The Jura Hotel amongst others…. We returned to the Cottage to wrap up our stuff as we were heading out for the night . We headed over to Port Charlotte to have a meal at the hotel then went to Bowmore to meet up with Willie , Malcolm and a few fellow whisky forumers at the Lochside . After a few drinks My self , Mel , Willie and Malcolm moved up to the Bowmore Hotel to see North Sea Gas . 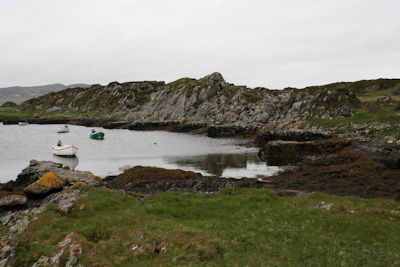 We managed to last until the Witching Hour when we departed back to Port Ellen . The Bowmore Hotel had a bottle of one of the “Scottish Wildlife” Whiskies , the Mortlach 10yo , which i have to say was a lot better than the Port Ellen one i’ve got and it was only £3.85 a dram ! Woke up to Glorious Sunshine this morning ! 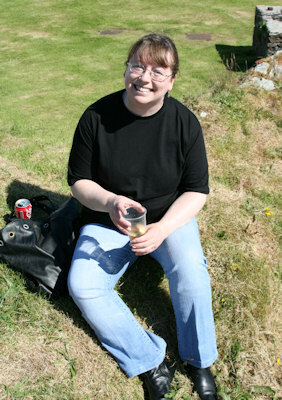 After Loading up the car we headed along to Ardbeg for their festivities , It seemed even sunnier when we got down there ! We weren’t taking part in any of the tastings but reports were very good about them ! After soaking up some rays at the Pier and on the hillock we retired to the Old Kiln for Lunch , as usual an amazing menu ! I had the Stovie and Mel had the Homemade Ardbeg Beefburger , we both finished off with the Raspberry and Drambuie Tart . 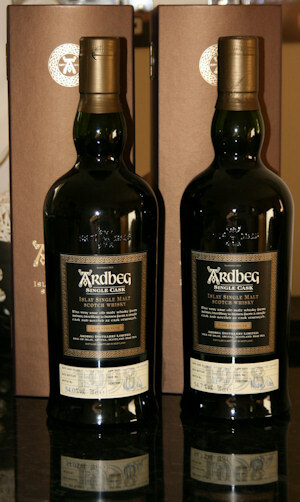 I even managed a 1975 Ardbeg from cask 1375 ! An Ardbeg Fan contemplates the View…..
After catching up with more Friends and bidding our farewells, it was time to leave Ardbeg for the Ferry . Mel enjoying the Day ! We may not have done as much this year but we’ve thoroughly enjoyed ourselves and it’s been great to finally meet a load of people off the old SOI Forum and look forward to seeing them again on Islay ! Only 9 weeks till we once again set foot on The Queen of The Hebrides ! 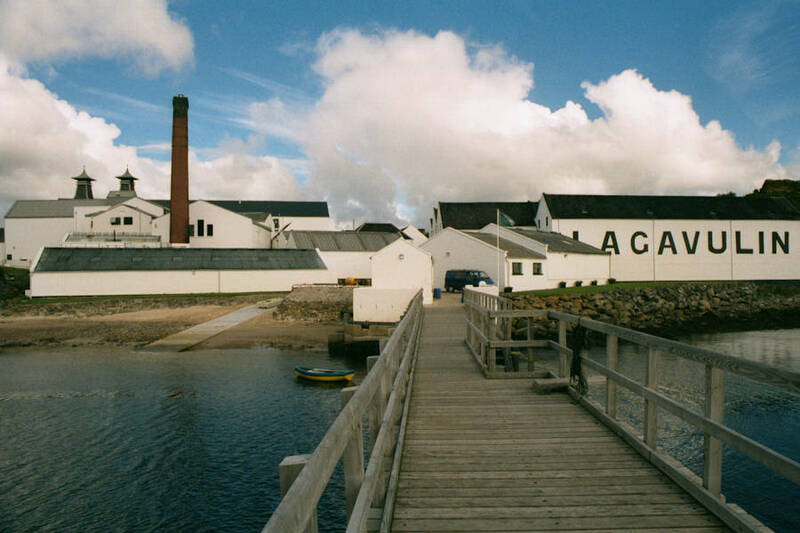 For the Seventh Time in a Row we hit Islay For Festival Week ! Once again it was an Early start to get the 1pm ferry from Kennacraig , met up with Martin and his Family on board and also one of Chris’s (adogranonthepitch) friends . The journey over was fantastic , smooth as a babies bottom and nice and sunny . 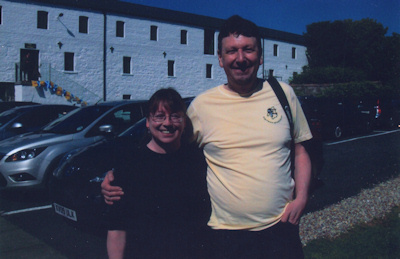 Once on the Isle we dropped our stuff off at Tigh Cargaman and dashed off to Ardbeg where we were greeted by Jackie and Mickey ! After a pot of tea , some lovely puddings and a natter with the main man himself we headed back to PE . After a visit to get the non-essential supplies (you’ve gotta have something to soak the whisky up !) 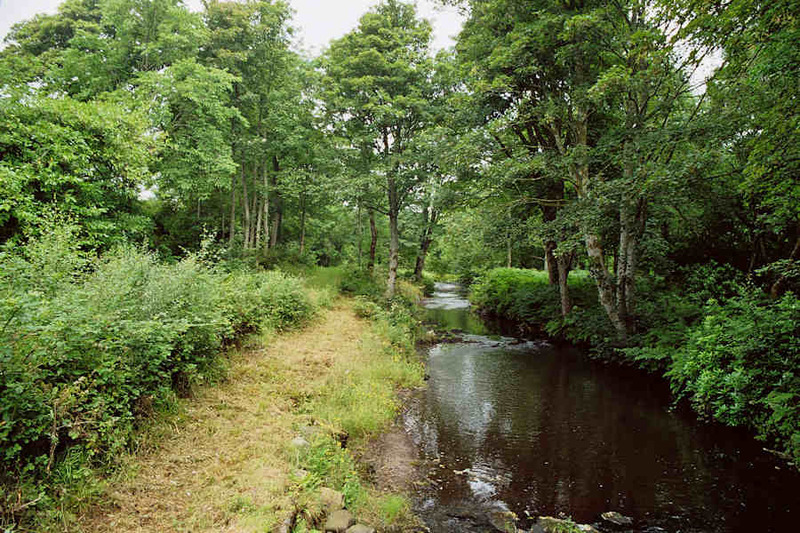 , we hit the Nippy chippy , which was rather conveniently parked opposite The Ramsey Hall , we soaked up some of the rays while eating our Fish and chips then returned to the cottage to enjoy a drink or two…..
Dram of the Day ! – The Renaissance , WOW ! Yummy…..
Once again we hit Laddie day with Beautiful weather , The sun is shining , the Skies are blue . There was a good turnout as usual with a mixture of both Visitors and Locals . There wasn’t much time between opening and Jims Masterclass but we did manage to grab a burger from the World Famous James Brown . Waves 2nd Edition 46% A youngster containing 2001 Bruichladdich , 2001 Port Charlotte and 2002 Octomore , from a mixture of ex-bourbon , sherry and wine casks . Had a red hue to it , Ozone ,dark fruits and smoke on the nose . Oaky , coastal and peaty on the palate with fudge . A long peaty finish with Dark fruits . Not one of my Favourites . PC 7 Unity 61.7% The next step ! Bright Gold in colour , a more balanced PC , heading the right way ! Laddie 16yo 46% A 1991 Laddie finished for a year in Margot Casks , Bright Rose in Colour , Laddie Cream fudge on the nose with Red fruits on the Palate . Mel really liked this one . Laddie 1988 50.7 A “traditional” Laddie (yeehaa !) 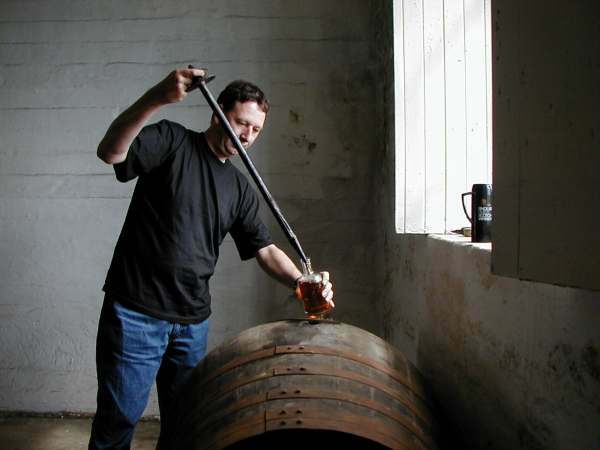 from ex-bourbon , Pale Straw in Colour , Laddie Fudge , green Fruits and Digestive Biscuits on the nose . Malty and green fruits on the palate . Basically everything on a long finish . This would have been my Favourite of the day but for this……. Laddie 18yo 55% From Jims Secret stash (his words) From one of 4 casks left over from a previous acing , so it’s 15 years in Bourbon and 3 years in chateau Yquem , now i didn’t like last years 18yo O.b. that had been aced but this was absolutely stunning !!!! Both Martin and Mel agreed with me on the fact that this was the best of the day .
? Didn’t get to know what this was as time was running out and it was used for the Highland toast and it got slung back in one ! After the Masterclass we headed back to the courtyard , for a bite more to eat , Catch up with old friends , buy a couple of X4 Valinches and met Bobby from the WM forum . It was an absolutely wonderful day , good company , good Whisky and good weather ! Once again we rise to bright sunshine ! Todays events are just a short walk from the Cottage , the first is Literally down the drive and along the road for a few hundred metres . Once again i’m doing the Monday Morning Tour of the Maltings , it’s just a shame that last year some plonker ruined it for everyone and they aren’t doing the usual food and a dram at the end . It was another interesting tour which i think any Malt fan should do to see how the Barley is malted on an industrial scale . It was nice to meet up with Patrick again , i even got to look at his newly purchased Limited Edition Port Ellen ! 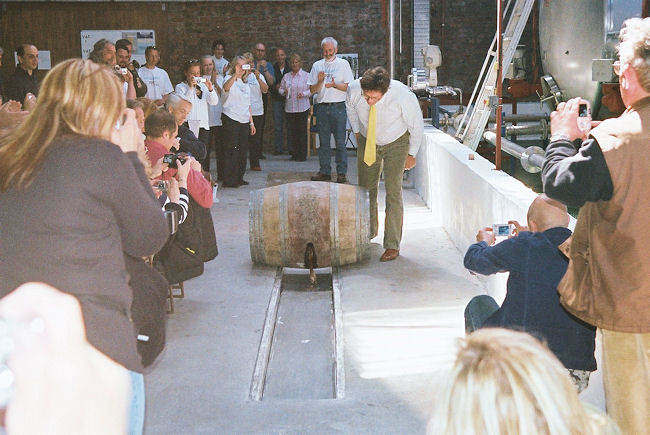 After picking up Mel , we headed along to The Old Kiln for lunch , as usual it was busy and while waiting for a table i relucantly had a dram of the 2008 Beist (need to find out if this is acually a 18yo now…..) . Once again the food was superb ( pan fried chicken in a creamy sauce with boiled rice) . At some point i had a 1975 from sherry cask 1375 thrust into my hand ( it’s magical where these drams keep coming from…….) , which was very , very good . Iwould go a bottle of this but for the price ! On par with the 76’s i think . It was nice putting another face to a name when Lee ( Newbie from the WM forum) introduced himself . Every now and then i like to take a bottle “home” and try it at it’s birth place , this year i took a Sigbeg 1967 30yo Cask 1140 , the 1967’s are exceptional casks and this one is no different . 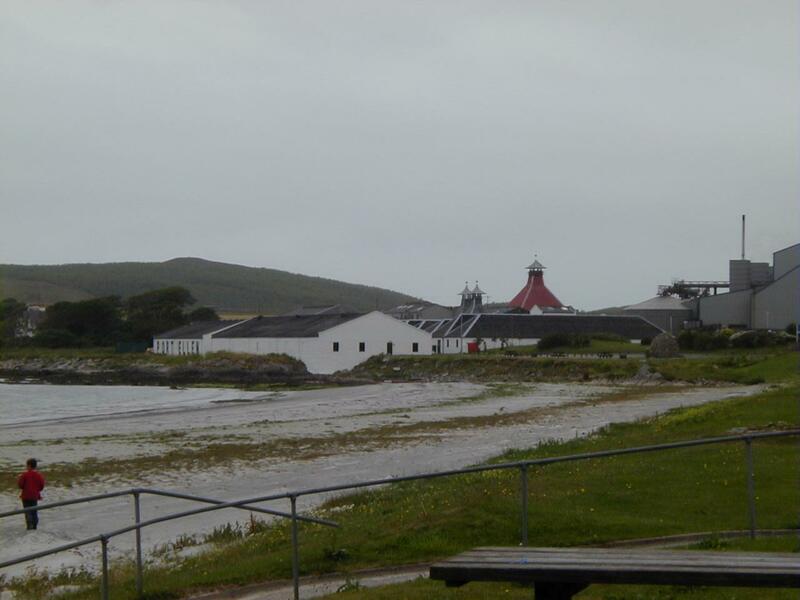 I poured a dram on the pier (my favourite place for having one at the distillery ) and it was fantastic ! Picked up one thing here that i’ve never gotten at home and that was Dark Chocolate , after a while we moved to catch the Rays at the Barrel Chairs and by this time the dram was well down and it was incredibly smoky . Always been one to share drams with friends i gave Angus , Charles and June and of course the main man Mickey a try . 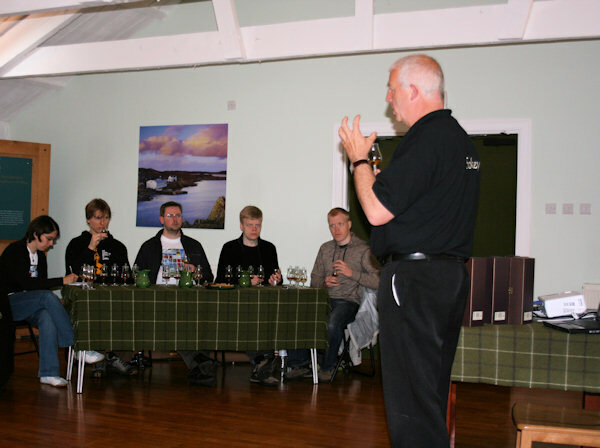 No complaints from any of them…..infact Angus was still going on about it at the Nosing Ceilidh ! Charles and June were anazed and i think Mickey was shocked……. 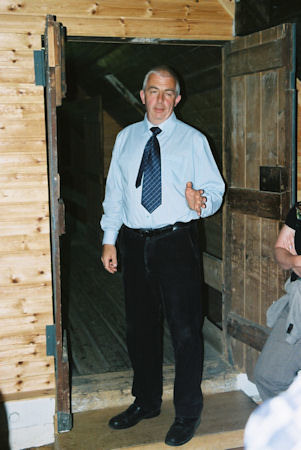 In the Evening i left Mel in the Cottage and headed along to the Nosing Ceilidh , Had a beer with Ian Gray before entering in to battle to once again fail Miserably ! The usual candidate won , Anders , but it’s a good chance to have a natter with the distillery people and catch up with old friends . Actually got to meet Willie (from the WM forum) at last who was at the festival with his brother in Law Malcolm . The morning was spent driving along to the Kildalton Cross , not much sign of wildlife though , must be sunning themselves up on the mountains…….. We then drove over to Bruichladdich to pick up a “Some Utter Fake” Valinch , after trying a wee sample and Mels eyes lighting up ( a good or bad sign depending which way you look at it……) we purchased another one , a really nice Aced Laddie ! We had a good natter to Mary , she even signed our copy of “The Whisky Dream” book . We also had a wee natter to Ella and The Main Man himself Jim ! Departing from Laddie we went for a drive down to Portnahaven stopping at the pub for a wee bite to eat , then after a drive back up the Atlantic coast of the Rhinns we went to the Port Charlotte Hotel for a bar meal . The food as usual was wonderful , lovely piece of local Lamb. We also had our first bit of rain today since we arrived , bummer ! It’s back to the Cottage now for a few drams of Ardbeg…..
Two Warehouses , Two different ends of the Isle , Two different styles…..
For the 8 and 15yo they actually took the ABV in front of us , didn’t make a note of them so can’t tell you what they were but i can tell you the 8yo was stunning with a drop of water in it but a bit harsh without . The 15yo was a very good example from a sherry cask and the 1966 was a grand dram , i didn’t think it was too woody though others did , the New Make was pretty good stuff as well . After the Visit Willie JJ kindly gave me a try of some 1951 Glen Grant which was pretty good too ! Another thoroughly wonderful afternoon , John is the perfect host , great wit , great knowledge ! 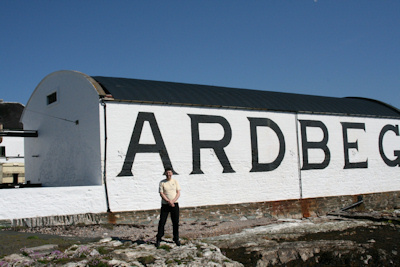 An un-official Ardbeg Day…..Sort of….. 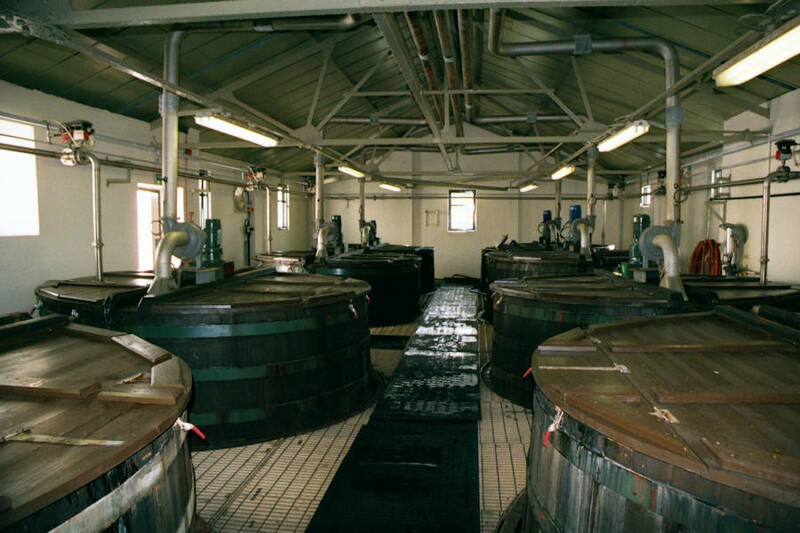 So we headed off on the bus to Ardbeg on a glorious sunny day , for the first bit of the morning we sat on top of the hillock and in the Barrel chairs watching the good lads of Ardbeg filling 1st fill Oloroso Butts , Mickey did say which region they came from but i didn’t write it down . 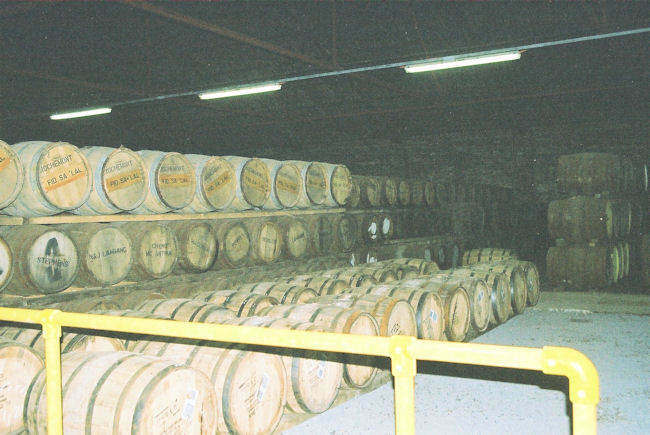 After baking for an hour we went into the Old Kiln for lunch and a bottle of Islay Ale , Boyd came in and asked me if the whisky was off…….. So at 2.30pm we gathered for Mickeys Managers Tour , slightly faster than usual through the production areas but longer in the warehouses…..My kind of tour ! 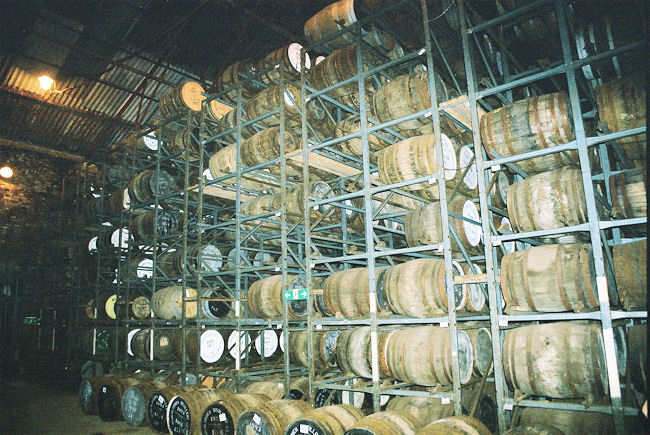 We went in to warehouse Ten to start with , looking at the racking system and then went to Warehouse Three , letting us have a wander at first to see what we could find , i found the cask of 2002 i filled at that years festival , unfortunately it wasn’t in a good place to try…….. The 2006 Madeira was a little immature but had a nice colour and the fruitiness was there , the 10yo Oloroso was amazing , lovely colour , dryness and taste to it, the Sherry and peatiness intermixing nicely. The 1990 was different due to the cask , strange finish , like tunes sweets , the 1975 was very nice but not as nice as the 1375 i had on Monday . Again the 2002 was slightly immature but had a nice lemon and Melon nose . 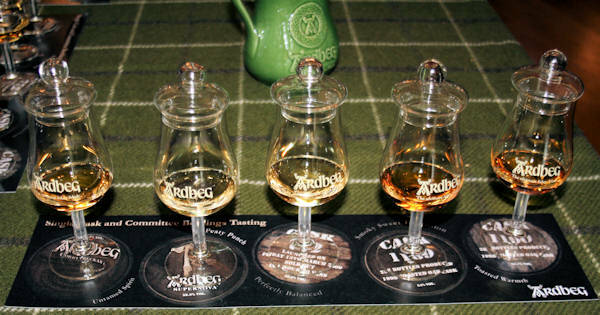 A good line up and a good way to look at how different Ardbeg can be through different ages and casks . Nearly the end of the week and it’s Bunnahabhain Day , once again it’s a scorcher and Bunnahabhain Bay looked as good as ever ! The only event i was doing was Kirstie McCallum’s Blending Class , this was the first one i’d attended since John Ramsey done one may moons ago in the same place . We were given 5 malts ( Bunnahabhain , Other Islay Vatting , Speyside Glenlivet Vatting , Speyside other Vatting and Highland Vatting ) and a Vatting of Grains , then asked to make a blend of 70% Grain/30% Malt . The winner got a Bottle of XVIII , unfortunately it wasn’t me but congrats to the Swiss guy with the lovely cheese ! Kirstie gave a very informative class but was fun with it . We got to keep the 200ml of blend we made . After the class i had a chat and a dram with Robert van Hal from the Whisky Society Skane , nice to meet you ! 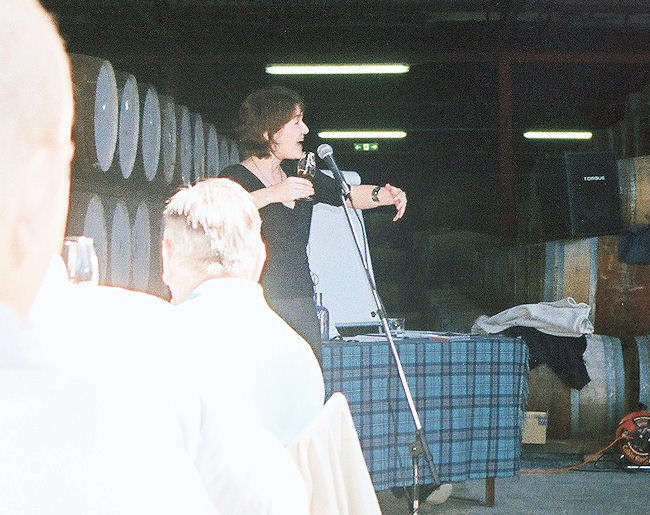 Actually had a chat with a few people that day……Willie and Malcolm , Charles and June , Ian Gray and managed to get to chat with Alison from BSD Marketing . Also managed to get a try of the Festival bunnie bottling , Very good , not as nice as the 1990 but definitely not worth £200+ . 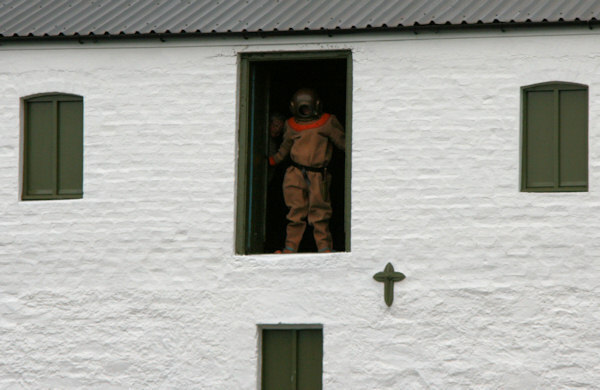 After a wonderful tub of Scallops pan fried in Bunnahabhain Whisky i headed back to the Cottage……. 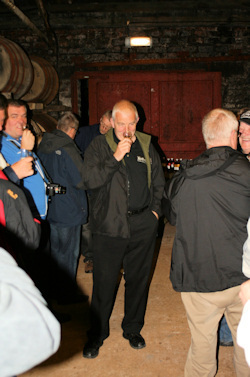 In the evening we went to The Midges , Music and Malt night at Bunnahabhain . We had a few drams at Charles and Junes beforehand including a Jura “Earth” , not bad for a Jura (i’m not a big fan of this malt) from a Sherry cask , it done what it said on the Bottle . After previous years when this was the managers night (none tonight except the host) , this was a bit of a disappointment , Johns hostings was as good as ever and the Isle of Islay Pipe band were great , they had everyone stamping and clapping but the night seemed to get off to a bad start with Norma Monro and her friend . There seemed to be a lot of extremely bored people sitting around us . Don’t get me wrong Normas music is good in the right place but really to get the crowd going there should have been some foot stomping stuff to kick off with . The usual excellent Clootie Dumplings (cooked by Lillians Mother) was also missing , they served a tasty Cullen Skink in it’s place . We left when the Dancing started as we had an early start in the morning to vacate the cottage . 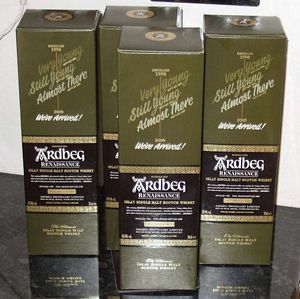 It’s Ardbeg Day and again it’s hot , hot , hot ! 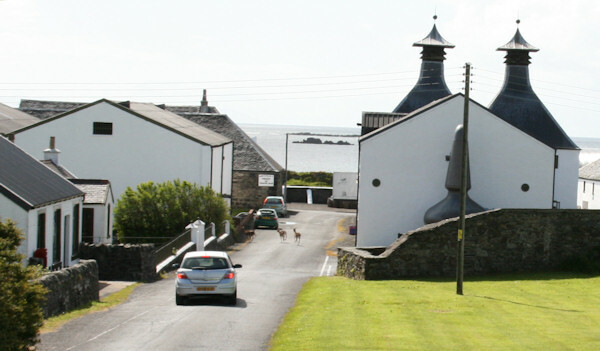 After Vacating the Chateau Spiritofislay for another year , we went for a drive along to The Kildalton Cross before returning to the Distillery . As on every other Ardbeg Day there was lots going on , most of which we couldn’t take part in due to us getting the afternoon Ferry off the Isle . A quiz , 2 managers tastings , lots of staff members tasting , Walks to the water source , a band and of course the famous Old Kiln food . We managed half the quiz and a meal (Fishtastic seafood Salad for me and a stunning Cheesey, Cheesey Macaroni for Mel ) . We managed to pick up a few of the special T-shirts before bidding farewell to another festival . I think weather wise this has been one of the best , all of the special events we’ve been to have been great . Thanks to all concerned and we’ll see you again next year ! 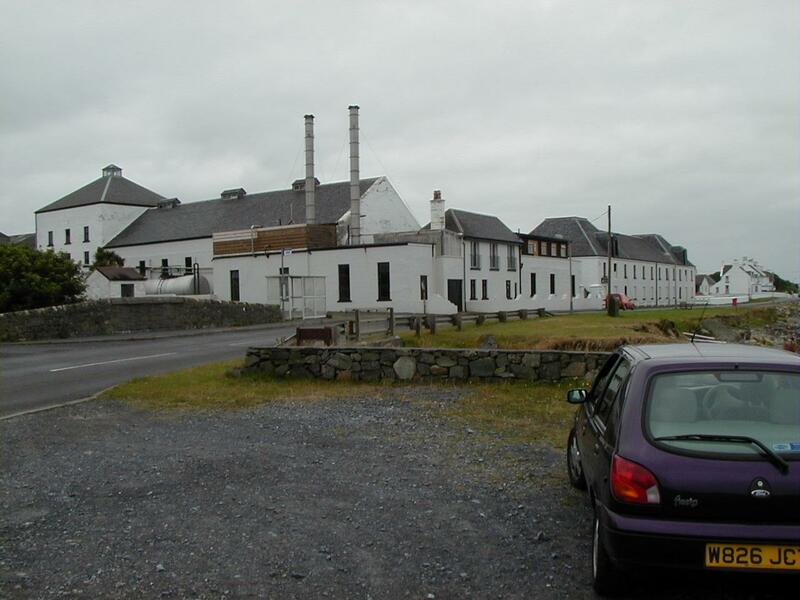 Once more to the Islay Whisky festival…. Our 6th year in a row …..who said they weren’t coming back after the first year ???? Another early , 4.10am , but we made good time up to the ferry , nice quiet roads just a shame about the odd showers we kept on hitting . Met up with Martin from the wednesday chat at the ferry terminal and Robin Laing on board . 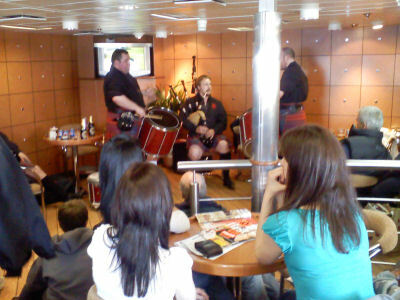 We had something a bit different on the journey over , a band playing in the bar ! 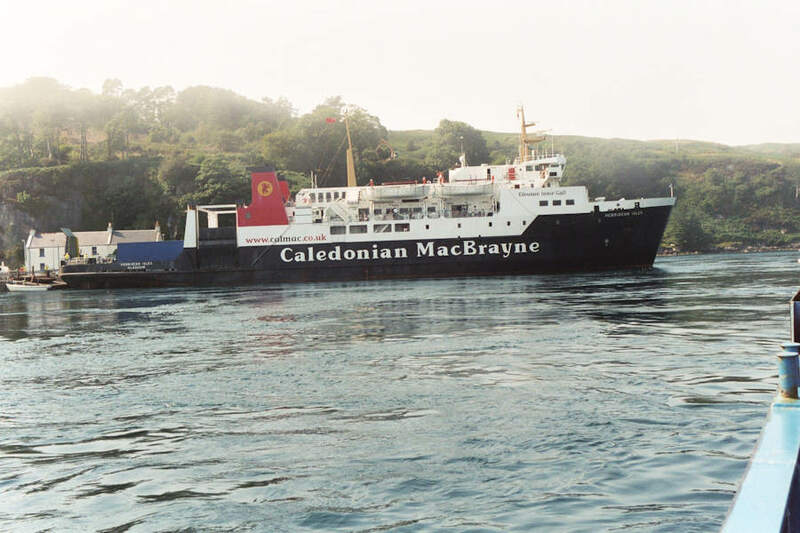 The trouble is Calmac have set a precedent now…. Celtic Spirit ( a rock-n-roll bag pipe band….) treat us to a short set including We Will Rock You and Yellow Submarine ! Highly entertaining ! They will be preforming at Laddie Tomorrow ( Sorry about the poor quality photo only had Camera phone at hand . Got Settled down in the Stable Cottage and went for something to eat at The White Hart where we bumped into some old Festival Friends . A good start to the festival , now onto Laddie Day……..
Well it’s Bruichladdich day and Surprise , Surprise it was glorious sunshine ! Spots of rain in the morning , bit breezy but glorious Sunshine !!!! 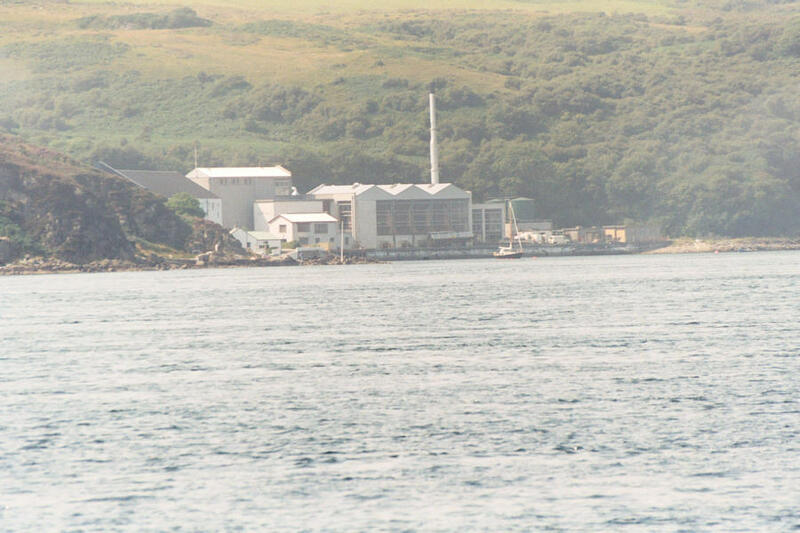 Didn’t get to cutting ceremony at Port Charlotte , we always get a taxi to Laddie and it would have been a bit awkward getting back to Bruichladdich . Things kicked off at 1pm due to the festivities up the road, first up was the Festival Valinch , a Port Charlotte (Cask 007, Distilled 28/05/01 , 61.5% ) . Then it was off to The highlight of the afternoon , Jims Masterclass , another highly entertaining afternoon with a superb selection of whiskies. For the first time it was a McEwan Double act that hosted the Masterclass , Jim was joined by daughter Lynn . We also had a BBC camera crew present and a wee musically breaks provided by amongst others Robin Laing . 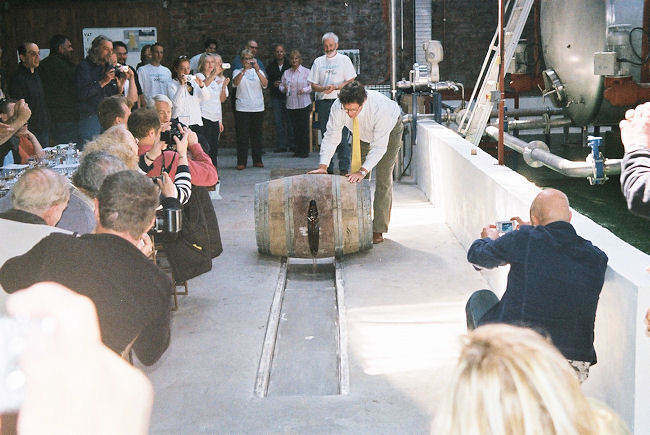 It was also the opening of the new vatting facility (the Vatican as Jim called it ) , the first cask was ceremonially emptied into the system by the chairman of Bruichladdich . 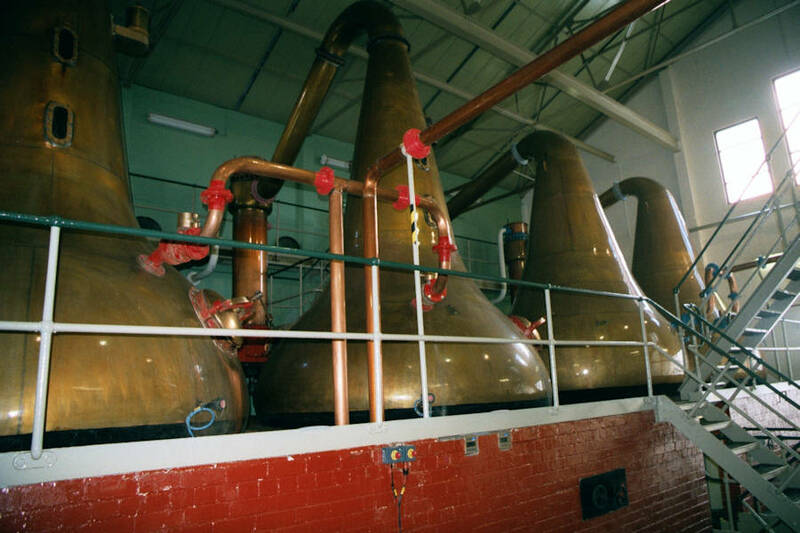 The 6yo Laddie was the first produced by the company in 2001 , slightly peated, sea air , green fruits , extremely fruity when water was added , a long finish with peat smoke . The 15yo was Mels Favourite , this one reminded me a bit of a Bunnahabhain , Edinburgh rock with dark fruits . To say that No.3 was a show stopper was an understatement , from a bloodtub at 78.4% , sherry , vanilla and so , so , smooth . Bloody Hell it was good ! No.4 is the last ever Legacy , made up from a 1965 Bourbon , a 1970 Bourbon and a 1972 Sherry Cask , it was my favourite (i love old Laddie ) , Classic Laddie ! Next up was the follow up to The Blacker Still , The Redder Still ! Made up of 1984 Laddie finished in another wine cask , Can’t remember which , it was a very good whisky . Last up was some 2003 Octomore (the really heavily peated stuff) , all i can say is a smooth PEATY dram , lovely stuff . At the end of the masterclass we were shown the new style warehouse 12 , for a racked system we were pretty impressed , they are certainly putting their money where their mouths is . Outside lots of mingling with friends , the usual abuse from Richard Joynson and more music from various artists including Robin again . A good day was had by all ! 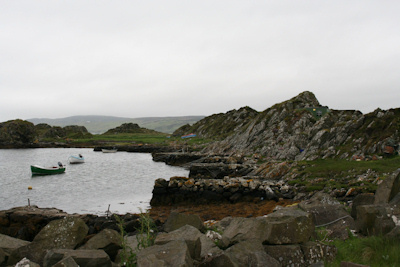 A Day in Port Ellen…. Today was a fairly easy day as everything we were attending was in walking distance of our base for the festival . First off was the Port Ellen Maltings Masterclass . We were given a brief tour of the Maltings to begin with , right from the steeps to the kiln , we then moved on to the engineering department (part of the original Distillery) to get talked through the history of the maltings , the finer points of malting , what exactly happens and how a Bag of Chocolate Eclairs and Marsh Mallows can explain what happens to a grain of Barley in the process ! 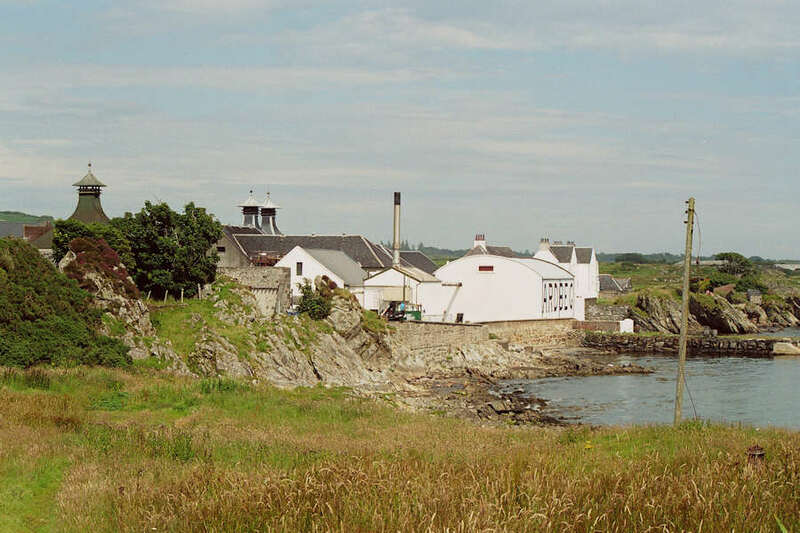 After Peter Campbell had given us a 6th edition Port Ellen (which i must say is probably the best of the annual editions i’ve had ) , we headed back to the main buiding for more drams and a bite to eat . Here i met up with 3 participants of the sites forum , Rene , Michael and Matt , Eventually we ended up back at Tigh Cargaman for a few drams and a natter . 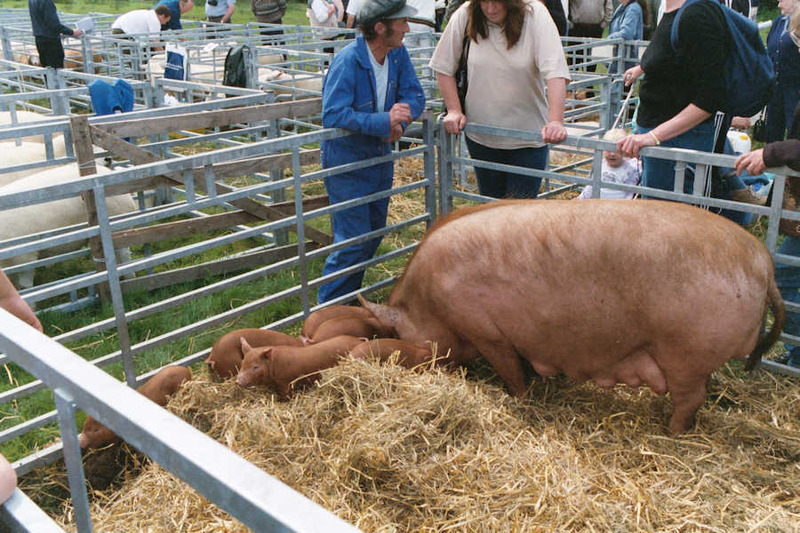 After the guys left and we had something to eat we headed along to Ramsey Hall for the Nosing Competition , this was the second year we’d attended this and we certainly hoped we’d do better than the “failed Miserably” of last year . A fairly sucessful score of 3 out of 10 on the night (unless you’ve done it don’t laugh , it’s bloody hard!) 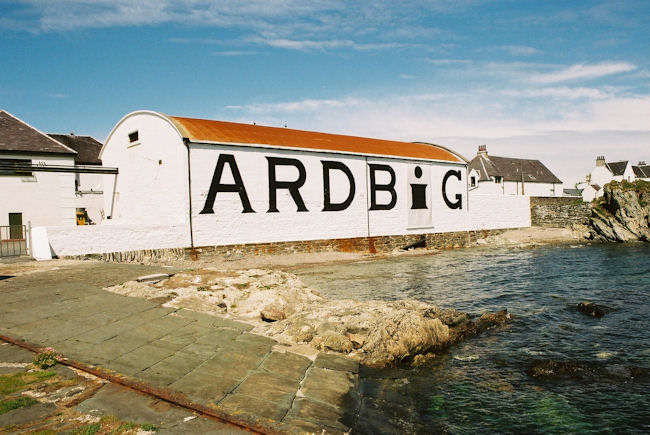 , at least i identified the Ardbeg , the Lagavulin and the Jura (smell give it away…….) . 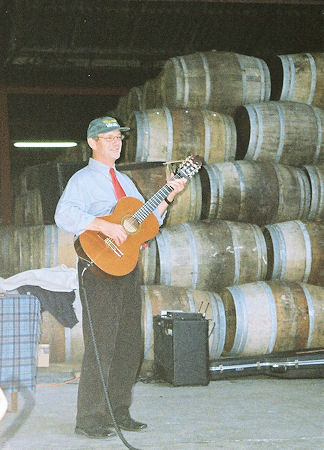 A Warehouse tour with John …. 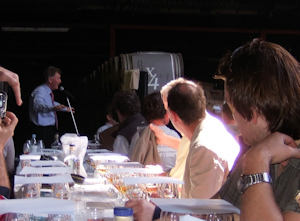 So onto Tuesday , after a quick trip to Bruichladdich to pick up a couple of Valinches i couldn’t get on Sunday it was off to the event we’d been looking forward to since last years , John (Mac lellans) Warehouse and Maturation Tour ! Once again John did not disappoint ! 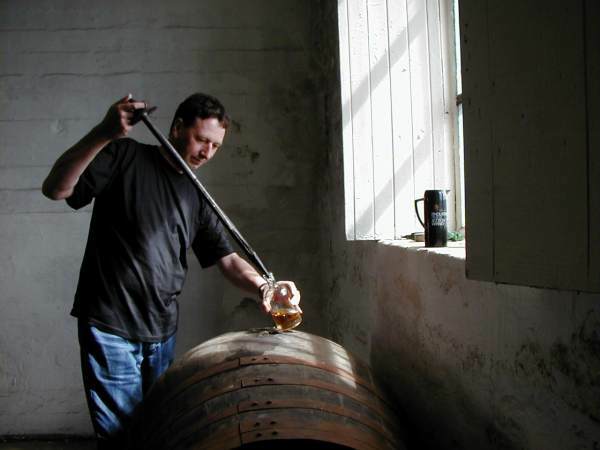 Great patter , fantastic stories and outstanding drams ….. The 4yo was really mature for it’s age , very balanced between the sherry and the Bunnahabhain taste (Mels Favourite of the tour ) . 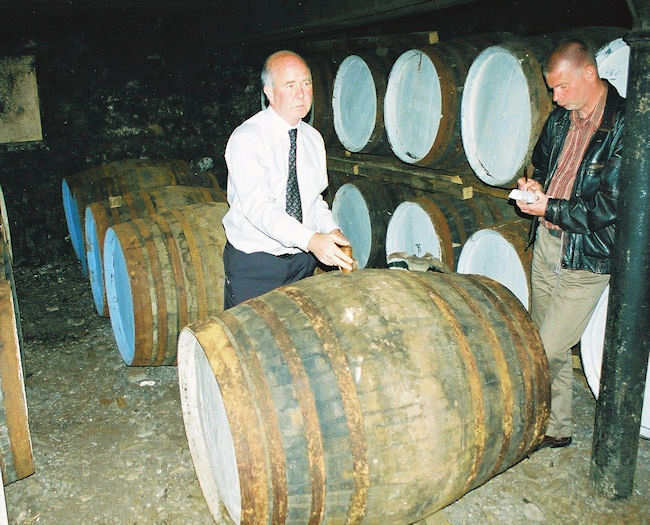 The 1977 was an exceptional dram , Edinburgh Rock , maritime air . 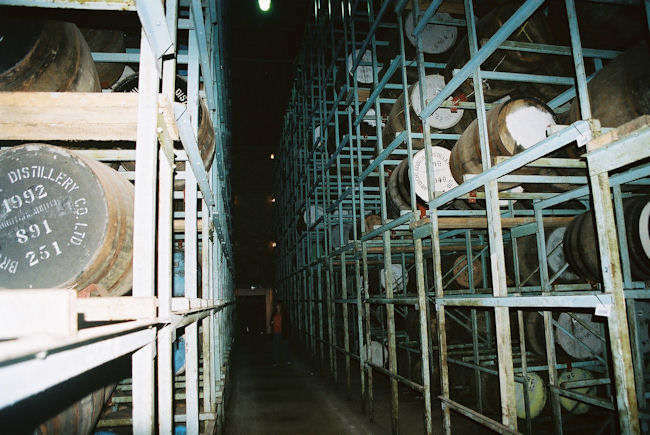 The 71 was amazing , everything you want from a Bunny and more , so smooth again maritimey and one of them drams where you could just have stood for an age in the warehouse smelling it , savouring every taste . 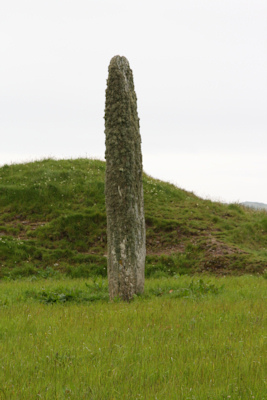 Last up we revisited the Moine , boy is this getting better with age ! smooth and peaty and an amazing Chocolate taste , Delicious ! The 71 was my favourite ( release more at a slightly cheaper price please !) , another wonderful afternoon with John , looking forward to the next one already !!!! After such a delight of malts we headed off to The Port Charlotte Hotel for a bite to eat ( Wouldn’t have done the day justice to have eaten anywhere else …..) . 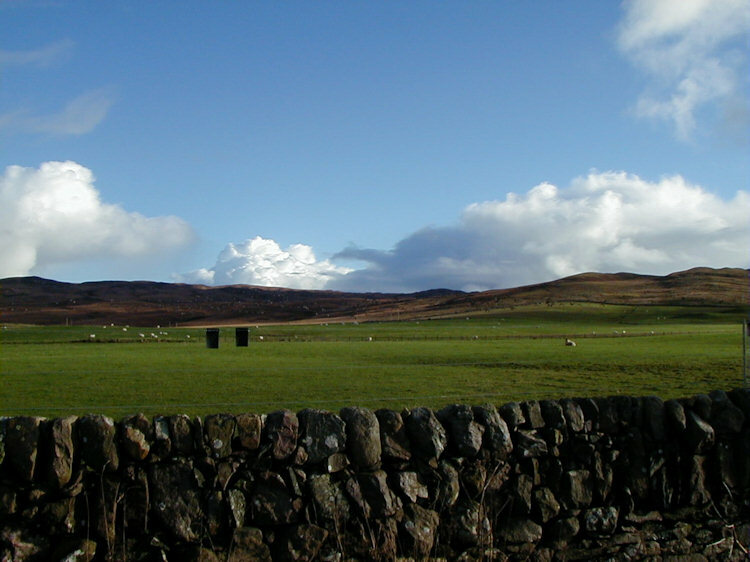 This was our only quiet day of the festival so we headed off for a nice drive down the Rhinns on a lovely sunny day! We stopped for lunch at the “An Tigh Seinnse” in Portnahaven , We had a gorgeous bowl of Homemade Portnahaven Crab Soup with Garlic Bread . 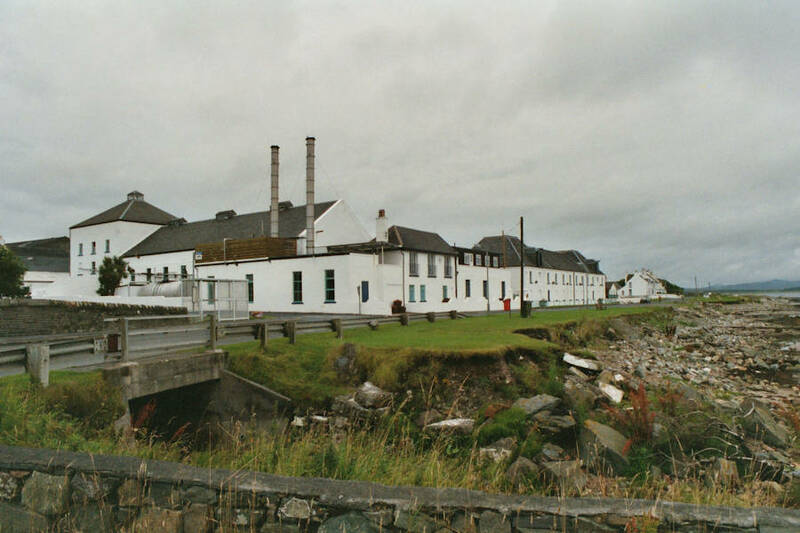 I also got to try The Bunnahabhain Festival bottling while there and it turned out to be another stunning Bunny Bottling , after lunch we headed back up the coastal road back to Port Charlotte . 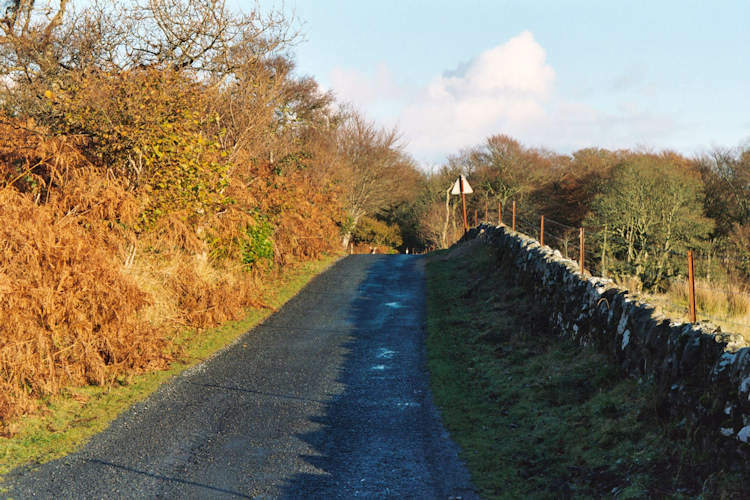 We then went for a drive over the Mulindry Road and eventually headed back to Port Ellen for a quiet night in packing our stuff up ready for the Morning Ferry . 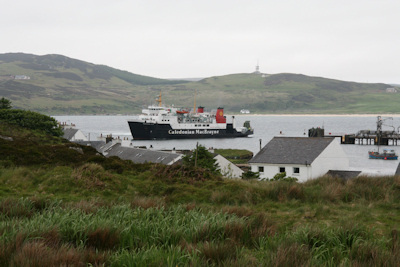 So we bid farewell to The Feis Ile on the 9.45am ferry from Port Ellen . 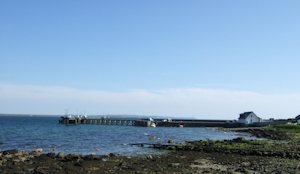 Another glorious week with superb weather but we shall once again return to the Feis Ile (next year !) . On the way back we stopped off at Inveraray for lunch at The George and paid Richard a quick visit at LFW before heading off home …….